Music Since ancient times, there have been two different genres of music in the Indian subcontinent: marga or classical music, based on ragas, and deshi or regional music. In classical music the manner of rendition is important, whereas in desi songs both words and tunes are equally so. The Charyascharyavinishchay, generally referred to as charyagiti, were composed by Buddhist monks or saints between the 7th to 12th centuries. Searching for Buddhist chronicles, haraprasad shastri discovered the manuscript of Charyacharyavinischay in 1907, making this the most ancient extant text of bangla language and song. 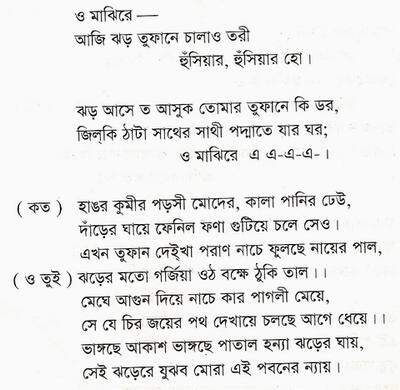 However, while abhog (the fourth or concluding part or stanza of a song) is common to both charyagiti and Modern Bangla Song, udgraha (the first part of a song), melapak (the second part of a song) and druva (the third part of a song) were used instead of sthayi, antara, and sanchari, which are used today. Udgraha and druva were compulsory, but melapak and abhog were not. These features are known as dhatu (literally, element) so if one dhatu is omitted, the song is called tridhatuk git (song of three elements) and if two are omitted, it is called dvidhatuk (song of two elements). Normally, this type of song is called 'prose song'. As the charyagitis are devoid of melapak, they are tridhatuk prose songs. he nathgiti, songs written to describe the greatness of Nath gurus, followers of Goraksanath, are contemporary with the charyapadas. There were two main strains of nathgiti: Minchetan or goraksavijay, which focus on Goraksanath, and the songs variously known as King Manikchandra's songs, Maynamati's songs, or gopichandrer gan, which focus on Manikchandra. The songs of Goraksanath narrate the feats of Goraksanath and describe how Goraksanath rescued his master, Minanath. The other strain narrates the legend of King Manikchandra and Queen Maynamati and of how their son, Gopichandra, became a saint. The writers of nathgiti include Hadipa and kahnapa, who also wrote charyapada. However, nathgiti lack the discipline of the charyapada. It is also believed that nathgiti performances differed from those of charyagiti. Possibly, nathgiti was sung in a mixture of song, dance and recitation, in the manner of panchali. 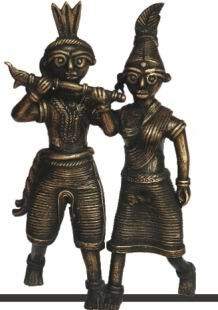 It may be noted that the story of Maynamati and Gopichandra is also known as Gopichandra's Panchali. One of the most remarkable contributions to music was jaydev's Gitagovinda, written in sanskrit, in the 12th century. Jaydev was the court poet of King laksmanasena. These verses, inspired by the story of radha and krishna, are a beautiful combination of words and music. Gitagovinda is a dramatic poem, containing songs and dialogue of the three main characters, Radha, Krishna and Sakhi, Radha's female companion. Gitagovinda consists of 12 cantos, 80 verses, and 24 songs. However, the essence of the poem lies in these 24 songs, which are sung in different ragas such as malavagauda, basanta, ramakiri, karnata, deshakh, deshavaradi, gondkiri (gunakari), malava bhairavi and vibhas. The following tals are used: rupak, nihsar, yati, ektal, and astatal. Several of the ragas of charyagiti are also found in the Gitagovinda as well as in Baru Chandidas' srikrishnakirtan. The ramakri of charyagiti has become ramakiri in Gitagovinda and deshakh in Srikrishnakirtan. The dhanusi of Srikrishnakirtan is mainly the changed form of dhanasi of charyagiti. The mallari raga is still well known. Several of the ragas that were used in the Gitagovinda are still in use today, such as bhairavi, vibhas, basanta, desh, etc. However, it is not known whether ragrupayan and the raglaksman of today are similar or not. The tals mentioned in the Gitagovinda are still used in Bangla kirtan today. Ragtarangini, an ancient musical grammar text, discusses the musical aspects of Gitagovinda and also mentions karnat, a raga that is in use in Bangladesh, especially in Bangla kirtan. In Gitagovinda there were two main singing styles: dhrupadanga and kirtananga. Dhrupadanga was the ancient classical style of singing and was accompanied by the pakhwaj. Kirtananga was melody-based and was accompanied by the dhol or mridangam. Originally, Gitagovinda was mainly sung in dhrupadanga. 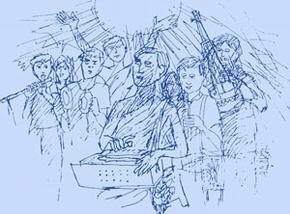 Through the influence of Sri chaitanya, it started being sung in the form of kirtan. As a result, the verses of Gitagovinda turned into kirtan. In this way Bangla kirtan was deeply influenced by Gitagovinda. Baru Chandidas' Srikrishnakirtan is a good example of the art of singing and is important both as a poetic song and as a verse play. It is thought that it also included dancing. Srikrishnakirtan contains a total of 418 verses, each with a different tune, tal and style of singing. It is a kind of pastoral song, narrating a pastoral love story and portraying village life. There are three characters in the song: Radha, Krishna and Badai. Many believe that Srikrishnakirtan was the source of jhumur song and jatra. Srikrishnakirtan mentions 32 ragas and raginis, among them, aher, kahu, ramagiri, gurjari, desh baradi, deshag, dhanusi, patamanjari, pahadi, vangal varadi, varadi, basanta, vibhas, velabali, bhatiyali, bhairavi, mallar, malava, shauri, shri. The tals which are found in the song are yati, krida, ektali, laghushekhar, rupak, etc. The sauri raga mentioned in Srikrishnakirtan is probably the degenerated form of the shabari raga that is used in the charya. Some of the ragas and raginis used in Srikrishnakirtan can be found in ancient writings on music, such as aher (abhir), kahu (kakubh), ramagiri (ramakri), dhanusi (dhansri), deshag, etc. The ragas and raginis mentioned in Gitagovinda are also found in Srikrishnakirtan, such as yati, rupak, and ektali. In Gitagovinda, however, there are more verses written in patamanjari than there are in Srikrishnakirtan, in which the pahadi raga dominates. vidyapati also made important contributions to Bangla song. Although his songs were written in Maithili, they were once very popular in Bengal. His Vaishnava stanzas are highly regarded, and his themes vary between spiritual love and secular love. Later lyricists tried to emulate him; rabindranath tagore himself was an admirer of Vidyapati and set some of his songs to music and sang them himself. Like Jaydev, Vidyapati also wrote Vaishnava songs based on the Radha-Krishna theme. A century later, Govindadas, another Vaishnava poet of Bengal, followed the footsteps of Vidyapati and became popularly known as the second Vidyapati. Rabindranath admired Govindadas and composed a tune for his song, 'Sundari radhe aoye bani' and included it in the Bhanusingha Thakurer Padavali (Bhanusingher Padavali). Vidyapati's verses are beautiful for both word and tune. The kirtan singers of Bengal have immortalised him by including his verses in Rasakirtan and Palakirtan. 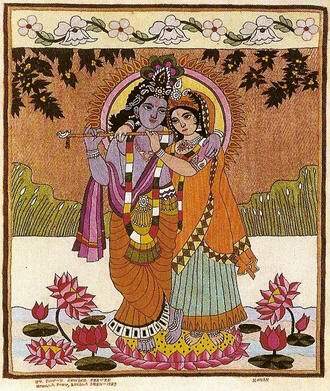 Many Vaishnava poets, inspired by Chaitanya, wrote songs based on the story of Radha and Krishna and made them popular all over Bengal. These verses, also known as kirtan, are an invaluable heritage of Bengal. In the words of Rabindranath Tagore, 'The joy we find in kirtan is not the joy of pure song; with it we also find the aesthetic sentiment'. Apart from Chandidas and Vidyapati, other poets who contributed to this genre include Govindadas, jnanadas, maladhar basu, sheikh faizullah, syed sultan, Balaram Das, Lochan Das, Basudev Ghosh, murari gupta, and Narahari Das. In Bengal from ancient times, kirtan was sung in praise of the divine. Buddhists sang charya, which is in fact another form of kirtan. While all songs which glorify God and describe his different names and attributes are kirtan, Chaitanya gave a specific form to kirtan and divided it into two types: kirtan which names God and kirtan which describes the doings of God. There are five parts of kirtan: katha, donha, akhar, tuk and chhut. Another part of kirtan is jhumur. The influence of jhumur can be seen in Bangla folk songs as well as in modern songs. 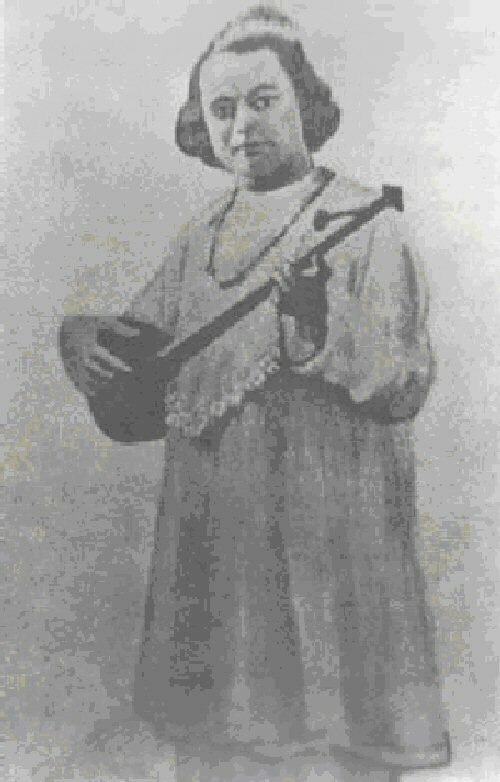 nazrul islam used jhumur in a number of songs such as 'Churir tale nurir mala', 'Tepantarer mathe badhu he', 'Ranamatir pathe lo', etc. Kirtan songs spread throughout Bengal towards the end of 16th century, developing into four branches: garanhati, manoharshahi, reneti, and mandarini. The manoharsahi kirtan was the most influential, particularly during the 18th and 19th centuries. It has also influenced the panchali. Dhapkirtan is a type of pastoral song that developed from the kirtan. Among the popular writers of this form were Rupchand Adhikari (1722-1792) of Murshidabad and madhusudan kinnar (Madhukan) of Banagram (jessore). These songs reveal the influence of panchali and jatra. Unlike the classical kirtan, however, dhapkirtan does not use complicated tals, such as dashkosi, ad, lopha, etc. The influence of dhapkirtan can be seen in quite a number of kirtan songs by Rabindranath. 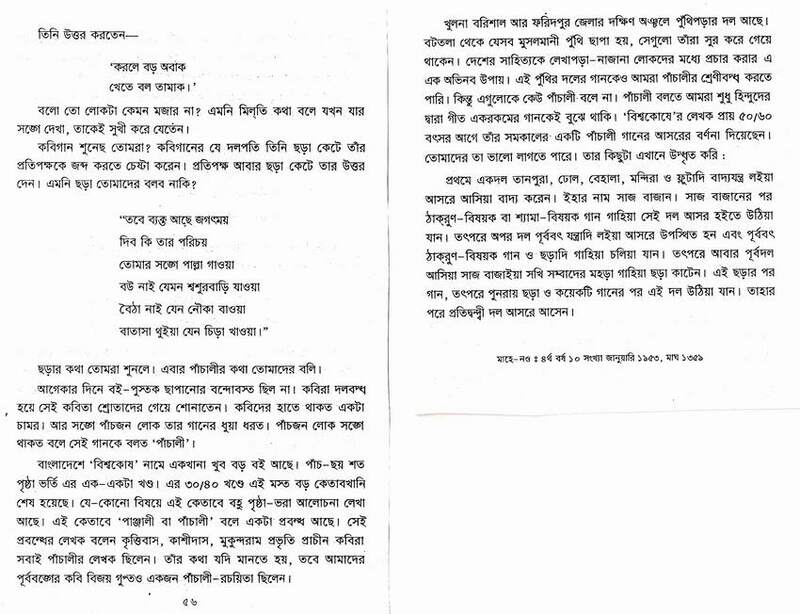 The song, 'Oke balo sakhi balo, keno michhe kare chhalo' (Ask him, Friend, ask him, why he is deceiving me), from Mayarkhela clearly reveals the influence of Madhukan. The age of the mangalkavya or mangal gan, ie panegyrics or songs in praise of deities, lasted from the 15th to the 18th century. These songs were based on ragas such as basanta, mallar, sri, kaushiki and sung to a specific tune known as mangalsur. The mangalkavya record the names of many instruments that were used during that period: Sahnai, Bansi (flute), Mrdanga, shankha, karatal, Mandira, rabab, dotara, Sitar, dampha, Khamak. There are three main thematic strains of mangalkavya: Manasamangal, Chandimangal and Dharmamangal. In addition to these there are also Suryamangal, Bhavanimangal, Annadamangal, etc. Among the Vaishnava mangalkavya the most notable are Chaitanyabhagavat, Chaitanyamangal, etc. These panegyrics reflect the traits of character, the customs, and manners of Bengal. 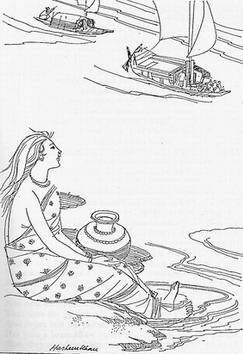 Like the mangalkavya, the panchali is also based on myths and legends. Usually, the panchali was limited to five short verses. In the 19th century there were changes in form, though the subject matter remained the same. dasharathi roy (1806-1857), the most popular and influential panchali writer of the period, introduced ragas such as lalita, vibhas, sindhu-bhairavi, yat and jhanptal. Rabindranath in his autobiography has mentioned the popularity of Dasharathi Roy. Other writers in this genre include Thakur Das, dwarakanath tagore, Rasikchandra Roy, Brajamohan Roy, ishwar chandra gupta, and Sannyasi Chakrabarti. The genre continues to be popular today with women singing Laksmir Panchali, Shanir Panchali, Mangalchandir Panchali, Satyanarayaner Panchali. 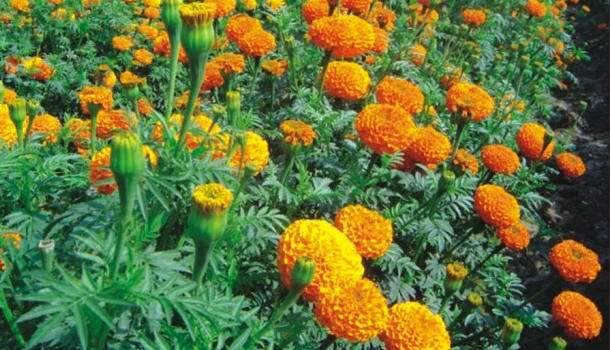 The rise of shaktagiti may be dated to the 17th century when the worship of the Mother Goddess, Shyama or Kali, grew in Bengal. Just as the story of Radha and Krishna forms the theme of kirtan, saktagiti is inspired by the divine energy of the Mother Goddess. 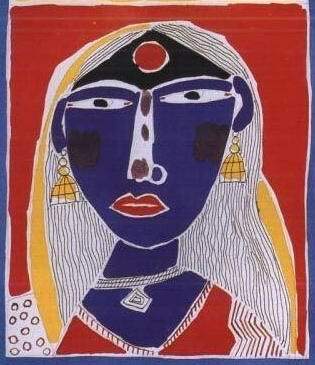 The Mother Goddess takes different forms; sometimes she is Durga, sometimes Kali. Though all songs in praise of the Mother Goddess are called saktagiti, songs in praise of her in the form of Durga are known as umasangit, while songs welcoming her during durga puja are known as agamani-vijaya songs. Songs sung in praise of the goddess in the form of Kali are known as shaktasangit. These songs are also variously known as matrsangit, kalisangit, chandigiti, malasi gan. The first, and perhaps greatest, writer of sakta verses was Ramprasad Sen, who was a devotee of Kali, was also an ascetic and a poet. Ramprasad's songs, known as Ramprasadi songs, may be sung in the manner of raga songs and also to simple tunes. Despite their simple words and tunes, the songs often have deep spiritual meanings, for example, in the following lines: 'Manre, krsi kaj jana na/ eman manab jamin railo patita / abad karle falta sona' (O my heart, it does not know how to cultivate/ So this human field remains fallow / If it had been cultivated it might have produced gold). 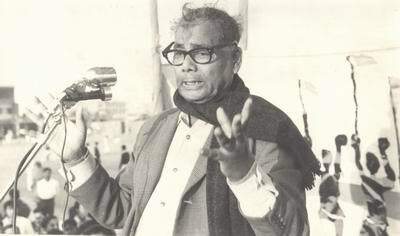 Ramprasad also wrote pala gans for short stage plays. Another important genre of Bangla music is kavigan or poetic song that evolved around the 18th or 19th century from the padavali as well as syama song and the kheud. The kaviyals, the poets of this genre, were not educated, but they knew the vedas, the puranas, the quran and political history. Regarding the origin of kavigan, Rabindranath Tagore said: 'In the new capital created by the English there was neither the old court nor the old ideals. At that time the mentor of the poets was an immature, corpulent figure named the masses and suddenly the song of the kaviyals became the ideal song for the court of that king'. These songs, which were created to entertain the common people, were mainly songs about Radha and Krishna. The kaviyals had to compose questions and answers extempore during their performance. They depended on ready wit and skills in versification to defeat their rivals in these poetic contests. The noise and tempo of drums, kansi, bells, or mandira rose up or went down in tune with the debate. At the beginning of the 18th century, a kaviyal named gonjla gaen first formed a professional group and started to sing kavigans. His disciples included Raghunath, Lalu, Nandalal, Nitai Bairagi, Nrisinha, haru thakur, bhola moira, Rambasu. Other famous kaviyals included Kesta Muchi, ramesh shil, and anthony firingee. Although Anthony Firingi was of Portuguese origin, he was specially attracted to kavigan and performed it regularly. There is another version of kavigan known as the bayati song. While kavigan is sung by two groups of singers, a bayati song may be sung by a main singer with his group. 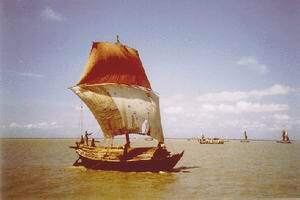 Some famous bayatis of Bangladesh include Abdur Rahman, Kuddus Bayati, Idris Bayati. tarashankar bandyopadhyay has immortalised this genre in his novel Kavi. The jatra song originated in Bangladesh in the 16th century. Jatra actually means a procession or other musical or dramatic performance that takes place in a temple during puja or other festivals. Though jatras contained dialogue, song and dance predominated. As a result, in the past these performances were called jatra song. Jaydev's Gitagovinda is very like a jatra song. 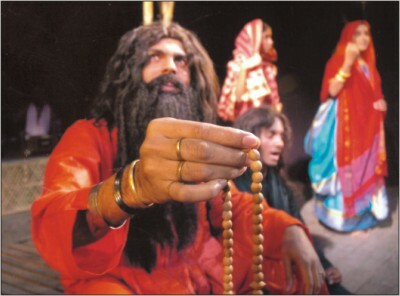 Baru Chandidas' Srikrishnakirtan is an example of a jatra pala, a short stage play, containing thirteen acts starting from the birth of Krishna to his separation from Radha. Chandi drama or Chandi jatra, written by bharatchandra, a pandit in the royal court of Krishnanagar, also contributed to the evolution of jatra song. During the 19th century, jatra themes expanded to include social criticism. Bharatchandra's Chandijatra and vidyasundar, Manasar Bhasan etc are noteworthy jatra palas. Manasar Bhasan was written to help people overcome their fear of snakes. Other famous 19th century jatra writers include Govinda Adhikari, Nilkantha Mukhopadhyay, Paramananda Adhikari, Madhusudan Kinnar, and Brajamohan Roy. Govinda Adhikari's Naukavilas was very popular at one time. Govinda Adhikari's disciple, Nilkanta Mukhopadhyay, wrote the jatras Kangsa Vadh, Yayatiyajna, Chandalini Uddhar etc. Quite a number of Nilkantha's songs are still sung. 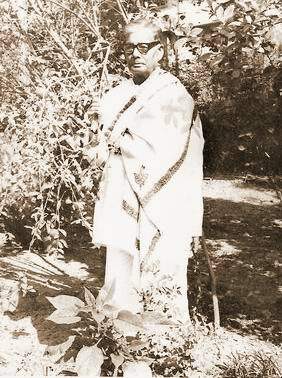 Krishna Kamal Goswami wrote Svapnavilas, one of the songs of which continues to be sung today: 'Shono Brajaraj svapanete aj/ Dekha diye gopal kotha lukale' (Listen, Brajaraj [Krishna], where did you hide after appearing in my dream?) The song is composed in khambaj and ektal ragas. In jatra the adkhemta tal, consisting of six beats, was popular. Gopal Ude, a popular writer of jatra song, used this tal in Vidyasundar. One of his songs in Vidyasundar, 'Ai dekha yay badi amar' (That house which you see is my home), was transformed by Rabindranath Tagore in Taser Desher into 'Gharete bhramar elo gunguniye'. At present jatra consists mainly of prose dialogue interspersed with songs and dances. The pala or ballad, written between the 16th to 18th centuries, forms an important folk genre. Some of the most well known ballads of Bengal are the maimansingha gitika and purbabanga-gitika. 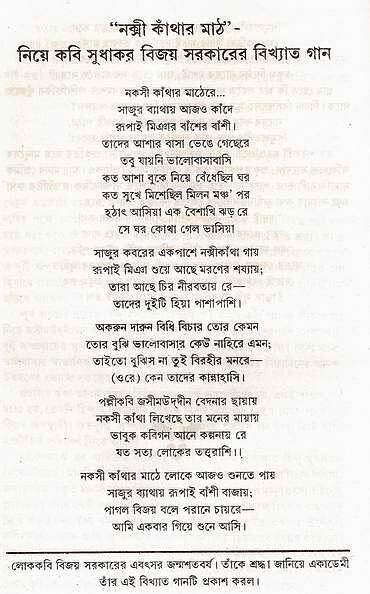 The political, social, economic, religious and cultural history of Bengal is found in these ballads. 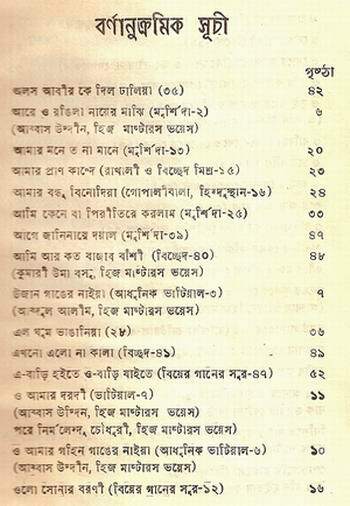 Some of the popular Bangla ballads include Mahuya, Maluya, Kanka o Lila, Kajalrekha, Chandravati, Kamala, Deoyan Bhabna, Dasyu Kenaramer Pala, Rupavati, Deoyan Madina and Alal-Dulaler Pala. These ballads were not just popular oral performances, they have also inspired both plays and movies. Deoyan Bhabna has been dramatised as Madhavi Malancha Kanya. 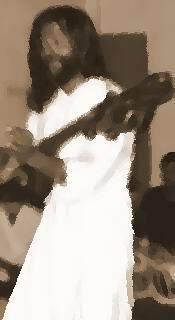 Another important genre of Bangla folk songs is the baul song, which perhaps dates back to the 18th century. However, written versions of Baul songs date from the 19th century. lalon shah (1772-1890) preached a religion of universal humanity and equality through songs such as 'Nanan baran gabhire bhai eki baran dudh / Jagat bharamiya dekhlam eki mayer put' (Cows come in many colours, but all milk is of the same colour./ I travelled the world over but saw all mother's sons [human beings] are the same). In the 19th century, the songs of kangal harinath Majumder (Fakir Chand) became particularly popular. At that time the Baul songs of manomohan dutta also became famous. Kangal Harinath and Rabindranath Tagore attracted the attention of the urban, educated society to Baul songs. Among other Bauls composers are Gagan, duddu shah, pagla kanai, Bhaba Pagla, Radha Raman (1833-1916) Madan, Shah-Noor, Sahabuddin, hasan raja. Baul songs influenced modern poets such as rabindranath tagore, dwijendralal roy, rajanikanta sen, atulprasad sen and kazi nazrul islam. Baul songs show the successful mingling of lyric and tune, a dominant feature of Bangla song. Songs based on classical ragas became popular in Bengal towards the end of the 18th century. Bangla tappa also emerged at this time, principally through the efforts of nidhu gupta or, as he is sometimes known, Nidhubabu. Tappa song is often known as Nidhubabu's tappa. This genre continued to be popular till the middle of the 19th century. Although Nidhu Gupta was influenced by the lively tune of the North Indian tappa, he introduced a note of pathos into the Bangla version. Later composers followed this particular characteristic of Bangla tappa. Other notable composers of Bangla tappa include Sridhar Kathak, Kalidas Chattopadhyay or kali mirza, Raghunath Roy, Ramshankar Bhattacharya, Habib Mian, and Hasnu Mian Tappabaj. Bangla tappa combines lyric and tune, as is characteristic of Bangla song. Bangla tappa influenced later poets such as Rabindranath Tagore, DL Roy, Atulprasad, and Nazrul Islam. Songs formed an integral part of the religious worship of the Brahma Samaj founded by Raja rammohun roy in the 19th century. Inspired by the ideals of the Brahma Samaj, Brahma songs proclaimed monotheism and declaimed against idol worship. Initially, brahma sangit were influenced by tappa and kheyal. Later, under the influence of Vishnu Chakrabarty and Krishna Prasad Chakrabarty, Brahma songs were written in the form of dhrupad, the solemnity and calm beauty of this genre being deemed more suitable for devotional songs. Writers, ranging from Raja Rammohun to Rabindranath Tagore, have written Brahma songs. This genre has greatly influenced modern lyricists. The 19th century saw the rise of nationalism as well as a return to tradition. There was a growing realisation that love of one's nation involved a love of one's own tradition and that, without revitalising folk culture, it was not possible to revive and rejuvenate the nation. In 1855 Ishwar Chandra Gupta attracted everyone's attention to the almost extinct folk songs by publishing some of them in his magazine sangbad prabhakar. Among others who played an important role in preserving ancient folk songs were the Tagore family of Jodasanko, particularly debendranath tagore. Later, people like Rabindranath Tagore, muhammad mansuruddin, jasimuddin, kshitimohan sen, dinesh chandra sen, and chandra kumar de collected folk songs like baul, bhatiyali, Sari, Jari, marfati and murshidi from different parts of Bengal and helped in their preservation and documentation. The urbanisation that started in the early years of the 19th century saw the beginning of modern Bangla songs. Rabindranath Tagore, Dwijendralal, Rajanikanta, Atulprasad and Nazrul Islam are still held in considerable regard as they combined attractive tunes with meaningful lyrics. Although other poets attempted to emulate this ideal, the songs of these five poets, who draw from both classical and folk traditions, are unique. The popular songs of Dwijendralal were actually written by him for plays. Nevertheless, his songs are diverse in nature. He was a skilled writer of patriotic songs and love songs. Rajanikanta Sen's songs, often better known as kantagiti, are inspired by patriotism and reflect the nationalistic spirit of the time. They are also inspired by devotion and dedication to the Creator. Atulprasad combined the classical raga and raginis with baul and kirtan tunes. In modern song Nazrul Islam was the first to break free from the overwhelming influence of Rabindranath Tagore. One of his main contributions was to the development of the Bangla ghazal. Though Atulprasad was the first to write Bangla Ghazals, it was Nazrul who perfected the form. Nazrul Islam further enriched Bangla song by bringing in diverse motifs and themes. He used diverse ragas and raginis, as well as folk tunes. He also occasionally employed Arabic and Persian vocabulary. Recorded by famous singers, his songs were very popular in the early thirties and forties. Some of the well-known singers of Nazrul songs include dilip kumar roy, Jnanendra Prasad Goswami, sachin dev burman, Kanon Devi, Angur Bala, Dhirendra Chandra Maitra, Abdul Halim Chowdhury, Feroza Begum, and Sudhin Das. A radical change occurred at this time in the modern Bangla song with the separation of lyricist from composer and artist. This separation proved detrimental to the union of meaning and tune that had been one of the prime features of Bangla song. Four famous composers of Nazrul's period are Saurindramohan Mukhopadhyay (1886-1966), Hemendra Kumar Roy (1888-1963), Dilip Kumar Roy and tulsi lahiri. Although Dilip Kumar Roy was exceptionally promising, he gave up music for the ascetic life. Tulsi Lahiri's songs are popular and are often mistaken for Nazrul songs. Saurindramohan's songs reveal the influence of Rabindranath. Hemendra Kumar was skilled in singing, dancing and acting. A number of his songs became popular on the professional stage. During this period, with the increasing popularity of Nazrul's songs, as well as the growth of the movies and gramophone records, Bangla songs began to attract the masses. With the growth of a new record-listening audience, new possibilities arose for Bangla song. As the gramophone companies started vying wiTheach other to release new songs, the need for composers, lyricists, and singers started increasing. Some of the noteworthy lyricists of this period are Sajanikanta Das (1900-1962), Hiren Bose, Shailen Roy (1905-1963), Ajay Bhattachrya (1906-1943), Banikumar (1907-1974), Subodh Purakayastha (1907-1984), Anil Bhattacharya (1908-1944), Pranab Roy (1911-1975), Premendra Mitra, Nishikanta, Shyamal Gupta, and Gauriprasanna Majumdar (1925-1986). Some composer-singers of the period include Jyotirindra Mitra (1911-1977), Binoy Roy (1918-1975), Hemanga Biswas (1912-? ), Sukriti Sen, Salil Chowdhury (1923-1994), and Amal Chattopadhyay. Some of the noteworthy composers of the period include himangshu kumar dutta, Dilip Kumar Roy, kamal dasgupta, Anupam Ghatak, and Subal Das Gupta. A number of singers contributed to the popularity of Bangla song: dilip kumar roy, Krishnachandra Dey, Kanan Devi, k mallik (Kashem Mallik), KL Saigal, pankaj kumar mallick, Shaila Devi, Vishmadev Chattopadhyay, Sachin Dev Barman, Jnanendra Prasad Goswami, Uma Bose, abbasuddin ahmed, Santas Sen Gupta, Feroza Begum, etc. Bangla songs have been closely associated with political and nationalist movements in Bengal. Thus, during the swadeshi movement that started in protest against the division of the Bengal in 1905, Rabindranath Tagore composed 'Banglar mati Banglar jal' (The soil of Bengal, the water of Bengal), to a Baul tune; Dwijendralal wrote 'Banga amar janani amar' (Bengal is my land and my mother); Rajanikanta called on everyone to discard western clothes and wear the coarse cloth of the motherland; Atulprasad wrote 'Balo balo balo sabe' (Say, say, say everyone). To these were added the fiery songs of Nazrul's Agnivina. 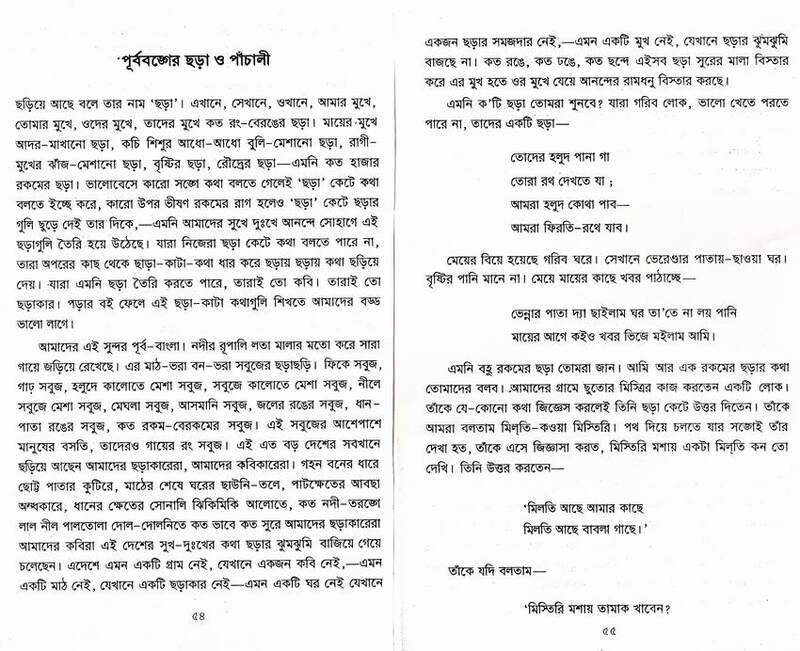 Nazrul's song, 'Ei shikal para chhal moder, ei shikal para chhal', calling on Bangalis to break their chains, inspired the Swadeshis in their struggle. Among others who contributed to the nationalistic movement was mukundadas, whose jatras, Desher Gan (patriotic song) and Matrpuja (Worship of the Mother), motivated the Bangalis to fight for their rights and against the despotic rule of the English. Later, during the language movement, in the mass movement of 1969 and in the liberation struggle, the songs that had been composed during the Swadeshi Movement were used against the Pakistan Government. Along with the revival of these older songs, a number of new songs were written, inspired by Bangali nationalism. These desher gan or deshatmabodhak gan, or patriotic songs, initiated a new trend. Different poets wrote poems, songs, and elegies in homage to the martyrs of 21st February 1952. Abdul Gaffar Chowdhury's 'Amar bhaiyer rakte ranano ekushe February' (21 February reddened with the blood of my brothers), set to tune by altaf mahmud, became the theme song of ekushey february and inspires people with love of their mother tongue even today. An anonymous poet wrote the song 'Rastra bhasa andolan karilire Bangali' for which the singer, Abdul Latif, composed the music. Abdul Latif also wrote 'Ora amar mukher bhasa kaira nite chay' (They want take away my mother tongue). 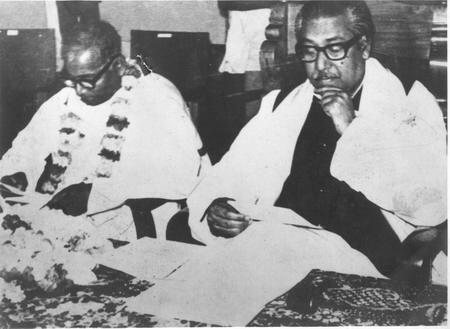 Sheikh Lutfur Rahman motivated the masses with 'Milita praner kalarabe, yauban phul fote rakter anubhabe' (Amidst the chorus of united hearts, the flowers of youth blossom red). These songs, written to commemorate the freedom struggle and the martyrs of the language movement, came to be known as desh o bhasar gan (songs of land and language). Bangalis still pay homage through these songs to those who died for their motherland and their language. on the ebb andtide we'll meet. Come October 31 and it's time for music lovers to remember Kumar Sachin Dev Burman. It was on this day in 1975 that the great music composer left us. To me Dada Burman's most enduring image is of a wizened potliwala baba with twinkling eyes who would delve deep into his bag and pick out an enchanted, animated tune and place it on your palm. A tune that would wriggle itself to your ear and start playing, mesmerizing you into a trance every time it did that. Or then there is the image of an ascetic with a ektaraa in hand chanting 'Rongila, Rongila Rongila Re, amare chardiye re bondhu koi gela re'. (Oh my dear colorful friend where have you gone away leaving me behind) or that of a boatman piercing your very soul with his call of 'Mere Sajan hai us paar'. So on his 27th death anniversary here is a tribute to our dearest Bondhu Rongila. Amare chadriye re bondhu koi gela re? Kumar Sachin Dev Burman was born in 1906 in Comilla (East Bengal) into the royal family of Tripura. His father Nabdweep Chandra Dev Burman was an accomplished sitar player as well as a dhrupad singer. He was also his first guru. 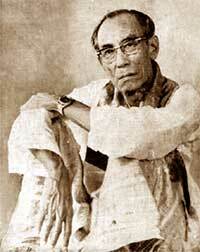 In his youth Dada Burman came to the musical capital of the East -- Calcutta. Here he further enhanced his musical education learning under maestros like Ustad Badal Khan. He was also a disciple and follower of the legendary K C Dey (Manna Dey's uncle). He started his career composing and singing for the radio. He made his mark as a light classical and folk singer before taking up composing for Bengali films. In 1946 he moved to Bombay, taking up Ashok Kumar's offer to compose for Bombay Talkies. His first film was Shikari. He struggled for a brief period, and decided to quit and head back for Calcutta, but was persuaded to stay back. He finally struck gold with the perennial 'Upar gagan Vishal' (Mashaal) and 'Mera sundar sapna beet gaya' (Do Bhai). With Baazi and 'Tadbeer se bigdi hi tadbeer bana le' sung by Geeta Roy, Sachin Dev Burman had finally arrived. He was married to Meera Devi who was a Bengali poet and singer. She wrote the lyrics for a large number of his Bengali songs and assisted him in his music making. Dada and Meera Burman had only one child, the legendary Rahul Dev Burman. D Burman's music was an eclectic mix of various musical forms. His primary and most favourite influence remained Bengali folk music. His early years were spent amidst the rolling hills and the lush mountain valleys of the North-East. The rich musical tradition of this region left an indelible mark on the young Sachin. 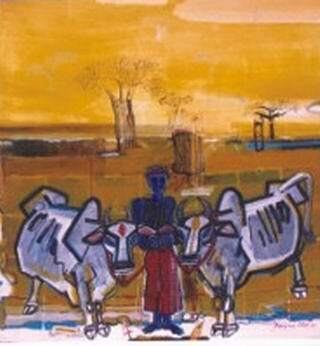 Years later he wrote that his art drew heavy inspiration from the outdoors of Tripura, where he spent his childhood. He always strove to capture the freshness of wild, untamed nature in his compositions. This trait is not only apparent in compositions like the dew fresh Kishore-Lata duet 'Gori Gori gaon ki gori re' from his tribute-to-the-NorTheast film Yeh Gulsita Hamara but also implicitly in songs like 'Piya bina, piya bina' from Abhimaan and 'Megha chhaye aadhi raat' from Sharmilee which have a strong NorTheastern influence in the melodic structure. He had a special liking for Baul and Bhatiyali folk forms of Bengal. He himself was an accomplished Bhatiyali (the song of the boatman) singer and came into prominence in the Hindi music scene with his memorable rendition of a Bhatiyali adaptation -- 'Dheere se jaana bagiyan mein re bhanwra'. His rendition is said to have mesmerized Jaidev so much that he sought him out to become his assistant! In addition to folk music, Rabindra Sangeet and light classical forms like the thumri formed his building blocks. Burmanda also had a very unique sense of rhythm. Melody and rhythm blended in perfect harmony to make his compositions extremely captivating. The outstanding point of Sachin Dev Burman's music is that it was never overtly complex and never pretentious. His tunes were always simple, graceful, hummable yet heartfelt. He would always say that film music should appeal to the common man. Film to him was not a medium to show off classical knowledge. And he never did. However, when he did occasionally go the classical route he came up with breathtaking beauties like 'Jhan Jhan jhan jhan payal baaje' or 'Poocho na kaise maine rain bitayi'. Legend says that Sachinda got this lesson in simplicity early in his career. During the early years when his music was not quite hitting the jackpot, Dada once caught his servant playing Naushad's Rattan song in his music room. Rather than get annoyed, he curiously asked the boy what appealed to him in that music. While he obviously did not get a cohesive answer out of the boy, Sachinda got the point. Film music cannot afford to be too esoteric. After that he kept complexity completely out of his music and made sure it was always hummable. He would often summon his servant or driver to take their final opinion on his tunes, trusting their judgement more than that of the musically literate people around him. To me, however, the most beautiful part about Dada's music is that, despite being aimed at the masses, it never lost its appeal for the connoisseur. This is no mean feat by itself. Even in crowd-pleasing songs like 'Jeevan ke safar mein rahi' Burman Dada betrayed his class. There are few composers who could achieve that balance. 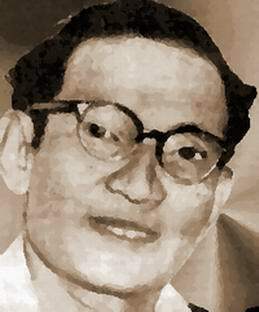 Sachin Dev Burman had a unique personality. Temperamental, mercurial, adamant and obstinate on one side, childlike, impish, simple and genuine on the other. He had small eccentricities that endeared him to the people around him. Lata Mangeshkar who had a much-publicized six-year row with him, today remembers him with much affection. She recalls how he would always be anxious about his song. His greatest fear was that she wouldn't turn up for a recording. She also recalls with amusement how he would always sing out a song to teach it to the singers. When he did that everyone would be at a loss because singing like him was beyond their abilities. Lata says, she for one would always have to go back to him to ask him how to sing her pieces. He was a hard taskmaster and demanded nothing short of perfection from the people who worked with him. One had to work extra hard to please him. But Lata says when he was pleased his appreciation was straight from the heart. He would come up, pat her on the back and shower her with blessings. And his utmost gesture of appreciation used to be to offer her one of his precious paans as inaam! He had a great zest for life that he kept up despite constant health problems in his later life. Though he was traditional in appearance Dada Burman was always very modern at heart, a fact that is not only apparent from how modern his compositions were but also from the name he chose for his bungalow -- 'The Jet'! Ameen Sayani once said about SD Burman, "Wo bachpan ki maasoomiyat mein jawaani ka nasha ghol ke tarzen banaya karte the" (His tunes were a heady mix of the innocence of a child coupled with the intoxication of youth). Almost 100 years after he was born his music still brings happiness to the world. So anytime you come across a little enchanted tune that wriggles up to your ear and seduces you into a magical trance, remember with a smile, the twinkly old man who created it. Amare chadiye re bondhu koi gela re. Bangla literature evolved from a form of musical composition known as Charya which was basically a north Indian musical form. 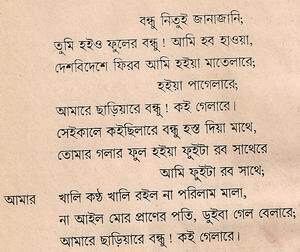 The Charya lyrics were similar to sonnet in length and its organized singing mode infused into Bangla songs a kind of classical discipline at the very early stage. Jaydeb, a 12th C Bangalee poet, modeled his songs on Radha-Krishna love lore and compiled in a collection called Geet Gobinda. The Geetgobinda is regarded as precursor of Dhrupada. Historically speaking the early Bangla musical expressions were expressed in loric forms and was modeled on the mystical Buddhist songs known as Charya songs. Bengali or Bangla, language belonging to the Indic group of the Indo-Iranian subfamily of the Indo-European family of languages. Bengali is one of the most widely spoken languages of the world. Bengali is the main language spoken in Bangladesh. Bengali has more speakers-some 190 million-than all but a handful of other languages of the world. Like other Modern Indo-Aryan languages, Bengali has drastically reduced the complex inflectional system of Old Indo-Aryan. Bangla folk music has a long history. Several people contributed to what has become one of the most important musical influences in lives of Bengalis on both sides of the (West Bengal-Bangladesh) border. Among these are Lalon Fokir, Hason Raja and Ramesh Shill. Abbas Uddin was a key player in popularising folk music later on. From 1885 to 1899. Rabinranath Tagore published four essays showing the importance of folk- literature. These four essays were compiled in his book Loka- Sahitya (Folk-Literature) in 1907. Tagore patronized others and he himself collected a large number of folklore materials from his vast estate in East Pakistan (East Bengal). He himself wrote, "when I was at Selaidah, I would always keep close contact with the Bauls (mystic folksingers) and have discussions with them, and it is a fact that I infused tunes of Baul songs into many of my own song^. 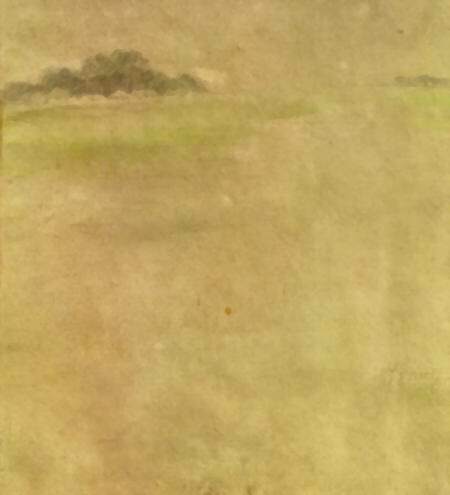 "It is my firm belief that without staying in the countryside for as long as he did Rabindranath could never have become what he was, either as a man or a poet. Critics have commented that Tagore has used numerous folklore themes in many of his poems, songs, dramas, novels and short stories. Tagore's example was followed by the leading Bengali journals. Bangiya Sahitya Parisada, a Bengali literary society, was established under his encourage- ment in 1895. 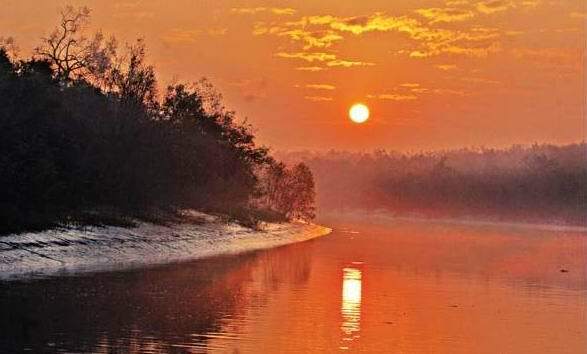 Bangladesh is a country of rivers.Like the tendrils of a creeper, or like the ornments hanging on a women's limbs, the sweeping curves and half-curves lines of innumerable rivers have traced a network over the fields. 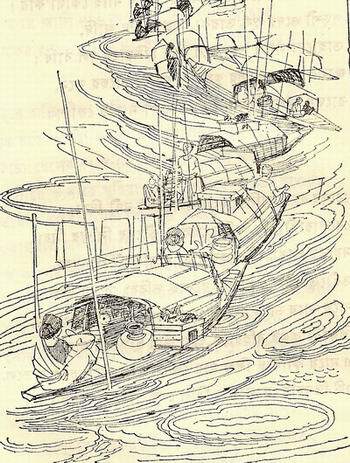 In rainy season number of people take to their boats. The songs of the countryside are the voice of the river. Who is he, the unknown, unvisible maker of the village tunes, stroking the rivers with his softfingered wavy hands as a player strokes the strings of an instrument, creating the many-coloured songs of Bengal in the bhatiali tunes. 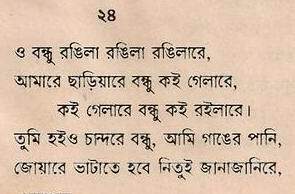 (From: Folk Songs of East Bengal by Jasim Uddin- Essays of Jasim Uddin Part II,Palash Publication, Dhaka, 2001). 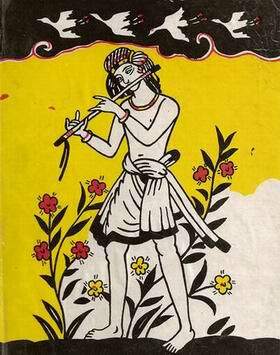 Gajir geet: Gazir Gan songs to a legendary saint popularly known as Gazi Pir. Gazi songs were particularly popular in the districts of faridpur, noakhali, chittagong and sylhet. They were performed for boons received or wished for, such as for a child, after a cure, for the fertility of the soil, for the well-being of cattle, for success in business, etc. Gazi songs would be presented while unfurling a scroll depicting different events in the life of Gazi Pir. On the scroll would also be depicted the field of Karbala, the Ka'aba, Hindu temples, etc. Sometimes these paintings were also done on earthenware pots. Gazi songs were preceded by a bandana or hymn, sung by the main singer. He would sing: 'I turn to the east in reverence to Bhanushvar (sun) whose rise brightens the world. Then I adore Gazi, the kind-hearted, who is saluted by Hindus and Mussalmans'. 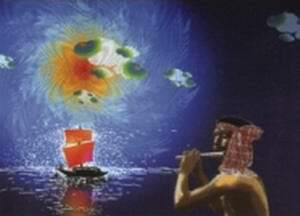 Then he would narrate the story of Gazi's birth, his wars with the demons and the evil spirits, as well as his rescue of a merchant at sea. Although Gazi Pir was a Muslim, his followers included people from other religious communities as well. Many Gazi songs point out how people who did not respect him were punished. At least one song narrates how Gazi Pir saved the peasantry from the oppression of a zamindar. Another song describes how a devotee won a court case. In Gazi songs spiritual and material interests are often intertwined. The audience give money in charity in the name of Gazi Pir. This genre of songs is almost extinct in Bangladesh today (Prof. Asraf Siddiquie). What is Islam? 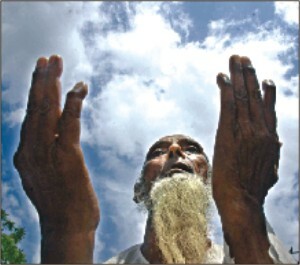 What is the relation of Muslims and Hindus in India? Where do these two religions which appear diametrically opposed differ ... all » and where are they similar? 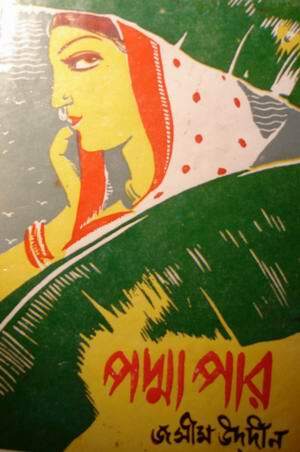 Faturing 10 songs of Kabial Bijoy Sarkar, an album by Kiran Chandra Roy titled "Nakshi Kanthar Mathey" has hit the market. Bengal Foundation released the album recently. Kiran Chandra's evocative voice with Durbadal Chattopadhyay's apt musical arrangement adds to the soothing quality of the album. Over a course of time, rural bards of Bangladesh followed different paths in their search for the Creator. Kabial Bijoy Sarkar (1903-1985) devoted himself to seeking the Creator, and composed songs which are known as 'bichchhedi'. He used elements from day to day life as references and connected them metaphorically in his verses. As a result, sorrow and agony stand apart as the core aspects in his songs. One will find Sarkar's quest for the Creator in the very first track of the album. The song titled "Parobashi Hoiya" articulates the agony of an individual in not being able to find his beloved [allegorically the Creator]. Known as an accomplished folk singer, Kiran Chandra's expressive vocals took the song to devotional heights. What listeners will find in the album is measured playing of folk instruments such as dhol, mandira and flute. This limited yet soothing use of these instruments creates a rural touch to the songs and the listener may feel transported to a rural ambiance. Using materialistic objects as a metaphorical reference is also apparent in the song "Posha Pakhi". We find 'Pakhi' or bird as such a reference here. Sarkar terms his soul as a bird and cries in advance for its loss someday. The singer once again made the verses lively with his apt rendition. It is as if the waters are limitless. And the boatman, in his solitude questions his own existence - where have I come from? Where do I go hence? such questions pervade the songs of boatmen. Like the lyrics of these songs which have taken shape from the waters of these rivers, the tunes too have blended into the lyrics from the lilting waters of the rivers." The folk do not transcribe their own rhymes (or tales) nor disseminate them widely in a modern urban world, and thus the reception, recording, and propagation of the rhymes takes many forms. Folk rhymes are an important part of the Bengali folklore tradition, which has existed for over a millennium. 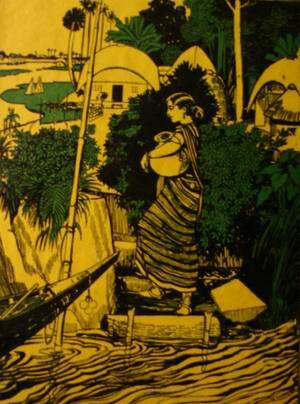 While folk rhymes in most cultures are seen as secondary to other oral traditions such as folktales and ballads, they are given equal importance in Bengali folklore. 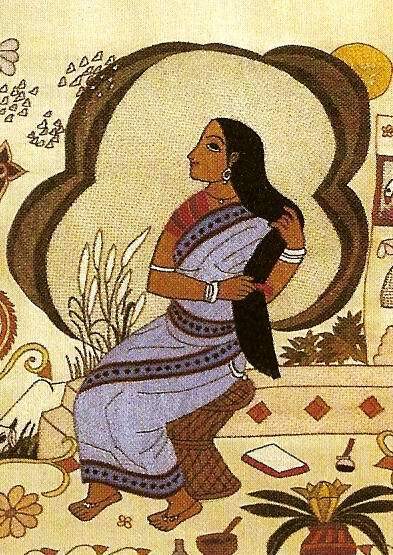 Their long history makes discerning origins impossible, but Bengali folk rhyme can be studied in terms of collective creation, variation, social function and dynamism. 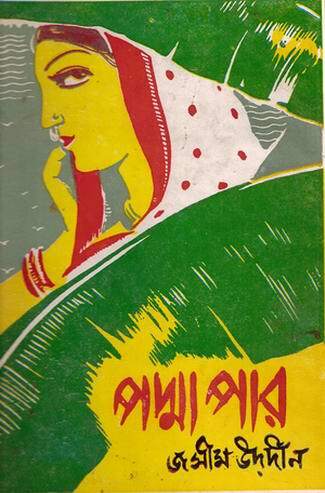 Kabi Gaan was a popular musical from in the 19th century Bangla. Kabi songs were sung in public music competitions by two rival groups each led by a kabi (poet) or kabiwalah. The songs were improvisations on a particular theme from usually from epics or myths. Once the competition starts, the Kabi of the winner (by lot) party first throws a question for the leading poet of the rival group to answer. Then the match goes on until one of the competing Kabi fails to answer correctly. The match is very absorbing. The whole performance is divided into several sessions and each session is again subdivided into several musical phases. Although kabi is primarily a form of folk music, it is very organized and the total music is delivered in several steps each having a name of its own. Kabi gaan as a music organization is uniquely Bangalee in Indian musical culture. Kabi songs are uniquely Bangalee in its structure as well. Structurally it is distinct from dhrupad which is made up of four movements: sthayi, antara, sanchari, and abhog. It is also distinct from kheyal and post-kheyal classical forms which are made up of two movements: sthayi and antara. He wanted to publish 5 volumes of Folk Songs of Bangladesh. 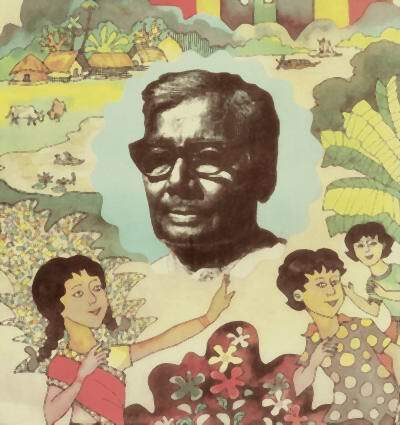 Bangla Academy published only one volume of his Songs "Jari Gan". Jasim Uddin refused to accept Bangla Academy Award because of their non-coperation of publishing several volumes of Folk Songs. Jasim uddin said that he collected more than 10, 000 thousands folk songs. It is a great national loss as these songs are not documented and interpreted by him. The rich heritage and treasure of bengali folk music and philosophy is found in his books Jari Gan and Murshida Gan. Jasim Uddin used to say if a government committe was reponsible to publish books, none of his books could have been published. In the old days the life of our country had been one integrated whole. There was no clear-cut line between the outlook and enjoyments of the rich and the poor, and there was give-and-take between the songs and stories of the scholars and those of literate villagers. The song of the poorest peasant, playing his one-stringed instrument in a remote corner of the village .might echo through the seven stories of a great man's house and bring delight there. A prince or a landlord would not hesitate to join the small knot of people who collected in the market-place to listen to .a ragged, wandering teller of tales. Before passing on he might even pay tribute to the artist's skill by hanging some rich gem round his neck. But now the culture of the modern educated classes was quite cut off from the traditional, unwritten literature of the illiterate. They despised the tradition because it was mixed up with ignorant superstitions, false religious beliefs and outworn ways of thought which would not stand the cold light of logic. In getting rid of it they hardly cared for the beauty and ancient knowledge which they were throwing away along with it; as if a man were to fling away a priceless ornament because of the rust which had accumulated on its surface. To same extent it was destroyed by the Wahhabite Movement (The Muslim World witnessed the appearance of several intellectual and religious movements which emanated from different Islamic territories in the 18th and 19th centuries. A number of social, political and religious causes provided motivation for these multi-faced movements) which I have mentioned. It was a kind of Islamic Puritanism which tried to weed out from the people's enjoyments everything that was corrupt, superstitious and earthbound. What was left was destroyed by the influence of British civilisation. Where that had come, the ways of thought' and life of the upper classes became altogether remote from those of the poor, and the old unity was gone for ever. The West has given us, much its science, its hygiene, its worldwide outlook and its sense of the value of time. The new Pakistan will accept all this and weave it into its .own pattern of life. All the same, the gift brought with it a loss. The old songs and ballads were too long-drawn-out for the new time conscious man to spend hours listening to them. They repeated themselves interminably and were full of ideas and incidents unpleasing to the modern mind. Yet there was so much in them that might have been preserved. Had there been any great mind with a touch of poetry, some one who loved the new learning and also loved his country's past, it might have been possible to save both. The old songs and tunes, still alive among the people, could have been collected and revised, purged of their corrupt and outworn elements and recreated. They might have become a' link, making the people's mind intelligible to the educated man and bringing the new outlook down to the consciousness of the illiterate. Unfortunately no such leader came. In the dazzling light of the Western sun the little earthen lamps with which people used to see into the corner of their own room had lost their power of illumination. They could look out at the whole world, but the beautiful things which lay at hand were hidden from sight. In the last generation the great Rabindranath Tagore, with his depth and universality of outlook, understood al appreciated the folksongs. Especially at the time when he writing Gitanjali, his love of them is apparent in the form and spirit of his poetry and in the echoes of his tunes. But Rabindranath was occupied with too many things to devote himself to the rediscovery of the village traditions. And after all he was writing for middle-class readers, he hesitated present the old tunes in their original form to people would have despised them. What he did was to create a kind of sophisticated version of them. In the minds of the educated classes it did much to awaken a sense of their beauty, but meant little or nothing to the cultivators whose genius first given them life. Another man who loved and understood them was Chittaranjan Das of Bengal the leader most beloved Bengal who was himself the very incarnation of Bengal. To him the songs were the expression of the spirit of the national in a sense they were the justification of the fight for freedom. He paid glowing tributes to their greatness in many of his addresses to the people. "How can a nation which sings like that remain subject to foreign-overlords? ", he would exclaim. Jasim Uddin narrates that he has collected more than 10, 000 songs from different villages Of Bengal but the Gazir Song from Sibrampur, Faridpur was one of his best collection (please listen Amarkantho II). Jasim Uddin is very proud of the poor farmers of Bangladesh - traditionally people of Bangladesh have deep love for the all people of the world - liberty, universal brotherhood, freedom and peace for all people of the world irrespect of race, religion and colour. Gazir Gan songs to a legendary saint popularly known as Gazi Pir. Gazi songs were particularly popular in the districts of faridpur, noakhali, chittagong and sylhet. They were performed for boons received or wished for, such as for a child, after a cure, for the fertility of the soil, for the well-being of cattle, for success in business, etc. Gazi songs would be presented while unfurling a scroll depicting different events in the life of Gazi Pir. On the scroll would also be depicted the field of Karbala, the Ka'aba, Hindu temples, etc. Sometimes these paintings were also done on earthenware pots. Gazir Gan songs to a legendary saint popularly known as Gazi Pir. Gazi songs were particularly popular in the districts of faridpur, noakhali, chittagong and sylhet. They were performed for boons received or wished for, such as for a child, after a cure, for the fertility of the soil, for the well-being of cattle, for success in business, etc. In 1922, Dr. Dinesh Chandra Sen of Dacca collected a small group of collaborators, and began gathering the ballads and folklore of East bengal. I was one of those who worked with him, helping to collect several volumes. Some of them were published with the english translations by the University of Calcutta; one volume was translated into French. I had been born and brought up in a village and brought up entirely by cultivators, and the folk-songs were in my very blood. To me, unlike Dr. Sen, the tunes meant even more than the words : they embodied the meaning of the traditional life I loved. They enchanted me with their beauty and power, and I was set on making the reading public understand what was in them. It was not only for the sake of the reading public, it was a question of preserving the life of the tradition itself; because the country people were visibly beginning to imitate the townsfolk, and liked what they liked. If the towns set the example of admiring the songs, the villagers would follow suit and take a pride in them; if the towns despised and neglected them the songs themselves would gradually die out of memory. So far, however,scholar had worked on our folk-songs in a scientific spirit. About this time Dr. Backey came from the University of Oxford to research on them as a trained scholar. He got the tunes exactly recorded, and studied them in the light of his wider investigations. ... Sometimes I would collect a group of songs and, knowing the taste of the towns, would select from them only those which were likely to be acceptable. I would expurgate the village versions, cutting out the lines which were too vulgar or too frankly erotie to pass in polite society. Sometimes I would learn a song in some cultivator's cottage, of which the melody impressed me but the words were clumsy and crude. So I myself would set new words to it better suited to educated taste. It might be that the villager who gave me the song knew only the tune and three or four lines of the words, and I would make up the rest in the same spirit. These half-original songs were often really valuable because the educated public liked them, and at the same time they suited the village singers and became popular. The taste was coming to life, and after a while we were joined by some famous singers of our time, whose singing made the folk-songs known much more widely. Many of the songs I taught them were recorded and some of them have become so popular that they are still to be heard in every village of East Bengal. Different gramophone companies began to take up the recording of folk-songs as a commercial proposition. By about 1930 folk-songs had gained their public in the towns, and the radio began to take them up. Sometimes I was able to bring a party of singers to the town from a remote village and give the audience a taste of the authentic, original things. iii) bringing men and women of every country in touch with the regional culture of their own soil and with the arts and crafts, dances and songs, and customs and manners of their own region, thus providing a natural cultural medium for their healthy all-round growth. By this three-fold sadhana (devotion), the Bratachari system seeks to enable men and women in each land to become, simultaneously, truly national and truly international. In 1934, the Bangiya Palli Sampad Raksha Samiti was renamed as The Bengal Bratachari Society. In 1936, he started a magazine Banglar Shakti for The Bengal Bratachari Society. 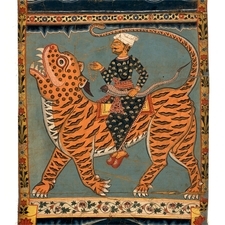 Gurusaday Dutt did extensive research in the field of Folk art, crafts and folk dances of Bengal. He collected objects of folk art and crafts from the countryside. He had great compassion for the artists and craftsmen who created unique art objects without any training or technical knowledge. Folk art was neglected and not appreciated in those days. He wrote in different journals about the wealth and beauty of folk art and left his collection on his death to The Bengal Bratachari Society. 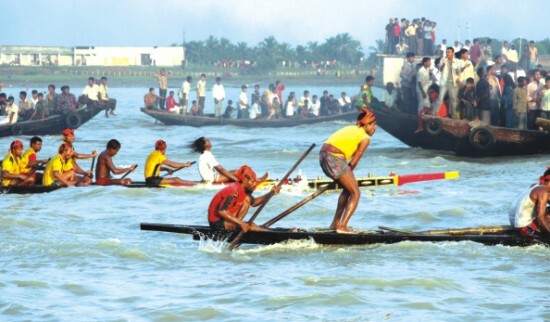 Boat races have been and still define an important element of folk culture. 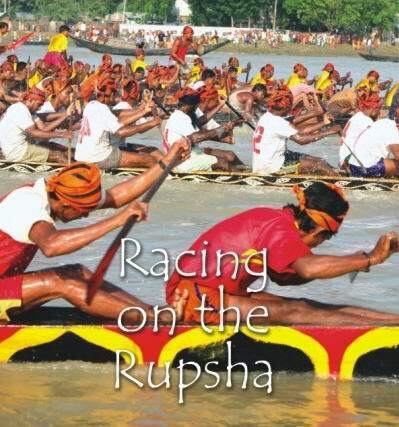 For centuries Nouka Baich, or boat races have been taking place in the subcontinent. A man with a dhol to keep the rhythm flowing amongst the rowers during the race, two men acting as navigators and one man sitting in the bow, dancing and flaunting his long messy hair, mostly for the sake of the audience. The Nouka Baich, which was to begin, soon promised a colourful performance, which would be witnessed by hundreds of villagers living near and far. Rowing at full speed with all their strengths, a combination of the rhythmic splashing of water with the singing and dancing on the boats filled the air, not to mention the loud cheers that followed from the audience. 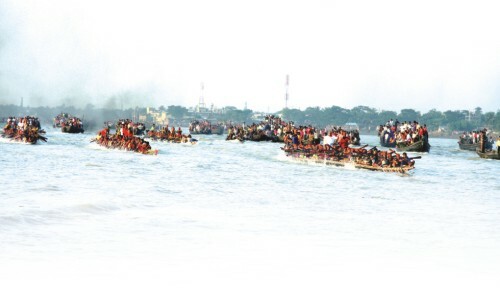 Most of the singing on the boats seemed to be a call to God to help them reach their destination as fast and as smoothly as possible. Ajker raneami bhangbo sabar ghar re. Kalo megh jano sajilo re. As if forms a dark cloud. On earth, the ants away it caitt. O my mother, my mother! Whither are you gone leaving me alone? Rat tui ja re ja pohaiya. God knows helpless maid's friend arrives how late at night. O night! ye close, ye pass. Why would I wear the necklace again? In agony of separation from Krishna. Kata robo ami pather dige chaya re. Amar 'galar har khuile e debo tare ina de. Amar man bale tar ba,nsi jan amar chokher jal!. My mind feels, my tears his flute appreciates. The tunes can be adopted go from country to country. In these swift-measure songs the tunes themselves are universally easy to understand. Because the words are predominant, a foreigner who does not know the language cannot enjoy them for very long at a stretch; but the tunes can be adopted go from country to country. In the long measured songs, on the other hand, the cadences are half-curved, long-curved, rounded, quarter-curved and full-curved. Where European tunes run in straight lines the tunes of East Bengal flow in curve's. The tune, not the words, is the main thing, and so those long-measure songs can be understood by a foreigner; only he has to train his ear to their simple cadences. One thins is worth remarking here. I have heard these songs sung to European audiences by our best singers, and although the audience liked them in a way, they could not enjoy them with full understanding. And yet when a European gave his own rendering of them, though he left our something that a Bengali ear would want, the European audience responded with full enthusiasm. In the same way, it is easier for me to enjoy songs, a European ear might find the rendering of which imperfect. Just as literature has to be slightly changed in translation, and only then it will yield its beauty to the foreign reader, so it appears tunes may be translated into foreign idiom. 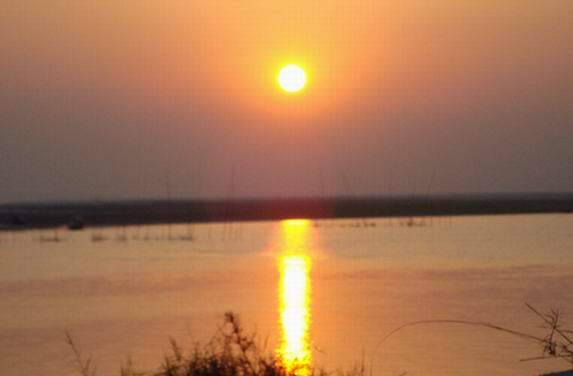 Our country of East Bengal is very beautiful. So many poets-many makers of tunes, are lying under the shade of the trees, under the roofs of the farmers' broken-down cottages, in the depth of the forest, in the shadowy corners of the jute fields, in a thousand moods and a thousand postures to paint the hopes and aspirations, the sorrows and the happiness of the land. There is not a single village where there is not a poet-not a single little community without its singer; and their songs pour forth incessantly as the bird-music echoes in the breeze. In our country the leaves of the trees and the changing movement of the paddy-fields make a colourful embroidery, and always there is pageant of green-vivid green, cool green, dim green, bright green, dull green, cloudy green, green that is blue almost to blackness; shade after shade of entrancing green such as cannot be found anywhere else on earth. In the folk-tunes of the country the greenness speaks. How many tunes shall I name? How many festivals shall I describe? In the tragic song of Imam Hussain, in gipsy songs, baul songs, murshida songs, rain songs, in songs innumerable the lovers call those they love, in song they invoke their God, in song they draw down the elemental powers and compel the clouds into the sky. Dea re tumi adhare adhare namo. Ye fall ceaselessly, 0 rain! O rain! ye fall ceaselessly. The songs of the countryside are the voice of the river. East Bengal is a country of rivers. Like tendrils of a creeper, or like the ornaments hanging on a woman's limbs, the sweeping curves and half curves and straight lines of innumerable Rivers have traced a network over fields. The rivers like beloved neighbours stretch our their rippling throats and sing the accomplishment to our country songs. The songs of the countryside are the voice of the river. Who is he, the unknown, unvisible maker of the village tunes, stroking the rivers with his soft-fingered wavy-hands as a player strokes the strings of an instrument, creating the many-coloured songs of Bengal in the batiali tunes. There is no village where the river is not .within two miles. For more than six months of the year the floods are out, and, in the rainy. season there is no work to be done. The cultivators fill up their leisure with an endless variety of folk-songs, and singing parities tour by boat from village to village. Nighum katha kaiya juo suni. The storm comes, One boatman is shouting to warn another. "The storm is coming. Hail, God and the Prophet!" "Come to Garden by Night"
None from the sacrred bosom. We shall plough no more for rice But to see how far it is to graves. Bashari Amar Harai Giache, (Namita Sen, Hindustan). The songs like Ujan Ganger Naya. 'Nishite Jaio Phulo Bane', 'Prano shokhi re oi shone kodombo tole' or 'O amar dorodi age janle' still persist and have been the backbone of Bengali folk music in this country. He admits that his songs and Abbasuddin's voice made a unique combination which ignited fire in the music world and was not replicated by any other performance, What this duo could achieve in just a few songs (10-12 bhatialis) was unparalleled in their impact on the Muslim community. The sequence is from the late 70s Hindi movie, Palkon Ki Chaon Mein. The song is a classic. When i was a kid, i could not tell whether that song was a sad or a happy song. It’s meant to be sad but it almost sounds like magical chanting, almost hypnotic begging for rain through prayer. Various movies had the same lines as the song, “Allah Megh de..” Dev Ananda’s Guide had those lines.Even Bappi Lahari used it for Amaanat (1994), a forgettable movie from the 90s with forgetful songs. What’s the origin of the song? 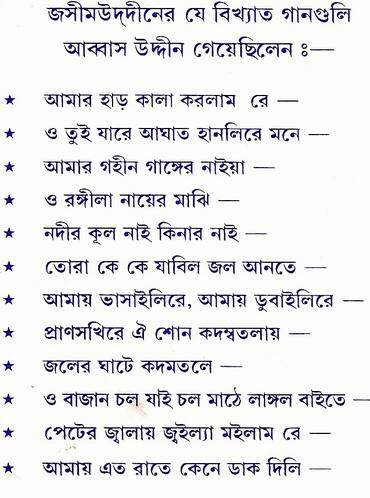 All these songs are the illegitimate children of a Bengali folk song. The song attributed to Bangladeshi vocalist Abbas Uddin Ahmed, is rooted in traditions of the Muslim peasantry of Bengal. Nashid Kamal Waiz, granddaughter of Abbasuddin, became very annoyed about the book Sritir Pot (Biography) and could not stand the criticism on Abasuddin. The comments of Ms. Nashid Kamal Waiz are naive. 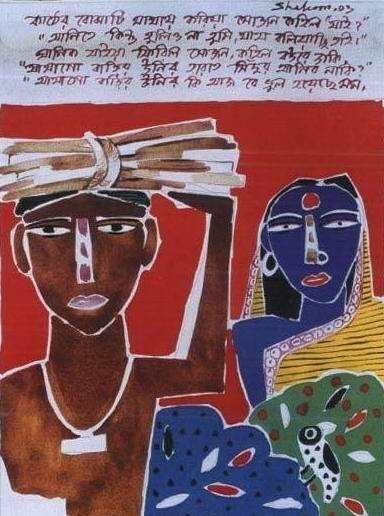 The book is titled Sritir Pot (Canvas of memories) and contains a few memorable pieces by poet Jasim Uddin. The first one amongst them is titled 'Abbasuddin,' and obviously this caught my eye. Usually when people write their memoirs the reminiscences are positive, and I was very amused to see a lot of criticism emerging out of Jasim Uddin's pen. In some parts of the article, Jasim Uddin has mentioned about the misunderstandings that existed between the two of them. All through the article, in spite of his criticism, the writing style depicts the genuine love and respect that Jasim Uddin had for Abbasuddin. He begins the article with a poem written and dedicated to this songbird who mesmerized him with the folk tunes. Jasim Uddin mentions that Abbasuddin was very slow at learning the songs. I found it quite amusing to read that Abbasuddin who mastered songs from Nazrul Islam at the flash of an eye, took months and months to learn the bhatiali. During Second World War Poet Nazrul Islam was selected by the British Government to head Song Publicity of Calcutta Information Ministry. As Nazrul became sick Jasim Uddin was summoned for this post from Dhaka University. Later Abbasuddin was working as Assistance to this department. No one else knows better each other than Jasim Uddin and Abbasuddin. Jasim uddin also negative bad about his elder brother in his Jibon Katha. Jasim Uddin and Abbasuddin used to have love hate relationship but it was dominated by an affectionate friendship (Jasim Uddin, Bangla Academy, 2003). Jasim uddin writes "Sritir Pot "is not only a memeory this is a history of the time I lived. I did not write everything as I was hestating to write all the happenings but what I have written is nothing but history. If someone dislikes it, I am, indeed, sorry. But I have written with love and respect. Jasim Uddin not only famous composer but he gave all the tunes of his music which is documented in gramophone recors. Radio and tv do not quote his name, even the family of Abbas Uddin think that these songs are composed and tune by Abbas Uddin!! Jasim Uddin collected several thousands of folk music from rural Bengal under the guidance of Prof. Dinesh Chandra Sen as a ramtanu Lahiri Scholar. He has written two books "Jari Gan and Murshida gan"
Abbasuddin only sung 10 songs of Jasim Uddin. Jasim Uddin was disappointed that Abbasuddin did not sing any more. This is the first time that I had heard anyone criticizing Abbasuddin as I have spent good forty plus years hearing his praise in every concert and public gathering, hence the article became very interesting to me. Jasim Uddin mentions that he was visiting Abbasuddin in his home in Dhaka, he found that my grandmother was upset for some reason and Abbasuddin was begging her to eat. Comprehending Abbasuddin's predicament, Jasim Uddin also pleaded to my grandmother, much to the annoyance of both, she did not eat. From having lived with my grandmother in the same bedroom for twenty-one years, I found this very difficult to digest. It was very difficult to imagine that in the early 50s my grandfather would reveal such a private matter to Jasim Uddin or the two of them would be at her feet to convince her to break her fast. Abbasuddin stayed in Kolkata from 1931 to 1947. Initially, he worked temporarily as a clerk in the DPI office and then in the Department of Irrigation in a permanent post. 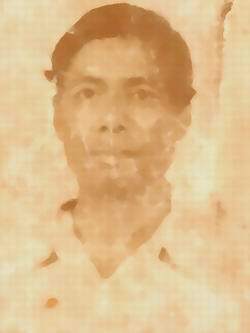 Abbasuddin Ahmed died on 30 December 1959.He sang different types of songs such as folk songs, modern songs, patriotic songs, as well as Islamic songs. He also sang Urdu songs. But Abbasuddin became renowned mainly as a singer of folk songs. In Kolkata Abbasuddin made a number of gramophone records with His Master's Voice as well as with Megaphone, Twin and Regal. By singing at various functions in villages, towns and cities as well as by recording his songs, Abbasuddin made music acceptable and popular in conservative Bengali Muslim society. 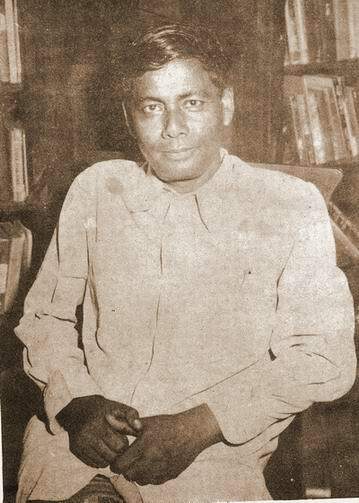 In the 1940s, Abbasuddin's songs played a significant role in raising the Muslim public opinion in favour of the pakistan movement (banglapedia). His daughter, Ferdousi Rahman, his youngest son, Mustafa Zaman Abbasi, and his granddaughter, Nashid Kamal, are also renowned singers (Wakil Ahmed). By the time Jasim Uddin was a student at Faridpur Rajendra College his poetry had already won him some fame. Kobor (Graves) was prescribed as the text for the Matriculation Examination at Calcutta University when Jasim Uddin was still a student in the 1. A. Class (Rajenra College, under Calcutta University, 1927) At the age of 20, Jasim Uddin became famous all over Bengal. Prof. Dinnesh Chanra Sen appointed him as a Ramtanu Laheri scholar. He published famous poetry books in 1927 Rakhali, 1928 Nakshi Kather Math, 1931 Baluchar, 1933 Dhankhet, 1933 Sujon Badier Ghat and in 1934 Hashu (Poems for Children) published from Kolkata by reknown publishers (Calcutta). So one should not compare orange with lemon. Jasim Uddin strated composing poetry and lyric at the age of eight. Although Abbasuddin and Jasim Uddin actively set forward in a mission to popularize the Bangla folk.They performed in every university function, Scottish church college and many others thereby creating an aura of folk music unknown to the audience of Kolkata, yet so familiar and popular amongst them. The songs like 'Prano shokhi re oi shone kodombo tole' or 'O amar dorodi age janle' still persist and have been the backbone of Bengali folk music in this country. Jasim Uddin mentioned that Abbasuddin came from Kuchbihar NW Bengal and that made difficult to teach bhatiali songs., whereas Momtaz Ali or Bedaruddin could learn without much difficulties.Jasim Uddin could not find the dream, devotion and mystic world from Abbas Uddin's songs but that he found in Momtaz Ali, Annanda and many village singers. This does not discrdit Abbasuddin. What disturbed Jasim Uddin is that Abbas Uddin sang only about 10 songs of Jasim Uddin, all of which a great hit in undived Bengal. Through Annanda Jasim uddin came to know Kanilal Shell, a poor musician. At that time Jasim uddin discovered Kanailal Shiel (a barbar in profession) of Village Karial, Faridpur the best Dotara players and brought him to Kolkata Gramophone Companies and he bacame famous for playing musivc instrument. Again Annanda used to play (dotara- guitar, two strings) and sing (original) music of Bengal that Jasim Uddin loved. 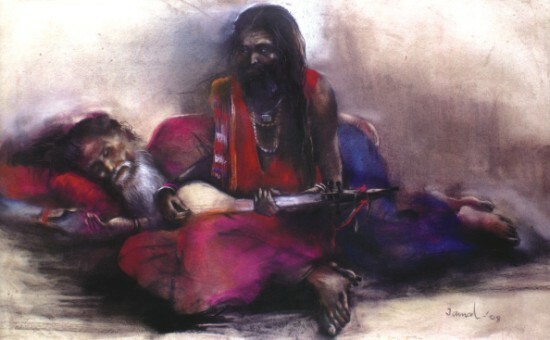 Music made them spiritual and devotional friend. 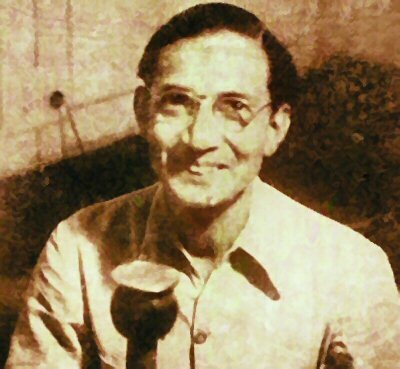 After independence (1947) Jasim Uddin aranged his appointment as a musician (Dotara plyer) at Song Publicity Department. Now Annanda a poor farmer can sit on a chair in front Abbas Uddin and Jasim uddin ( This was a room with two tables and 10 chairs for the singers). 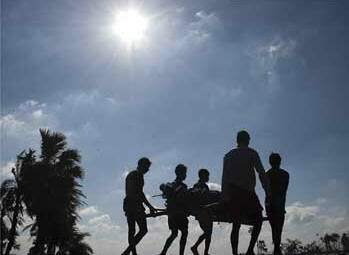 Nights after night Jasim uddin could not sleep - Annanda, a low cast hindu, was his hearts friend. Annanda used to play his guitar (2 string guitar- doteraand sung thousands years traditional mystic songs. 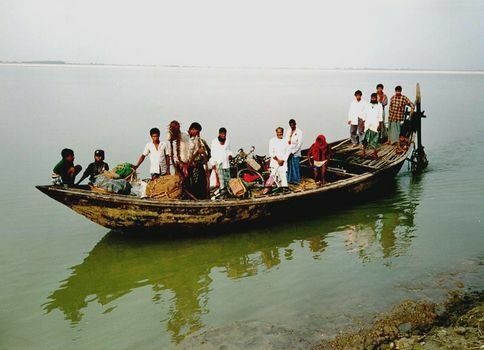 Only Jasim Uddin could appreciate this neglected, oppressed, poor people of Bangladesh. Songs that say - From eternity my mind (Antar) crys - I do not find him/her, whom I long to love (Sritir Pot page 148). The voice of the soil speaks to me. Possibly Jasim Uddin lamented for two reason - removal of Annada and refusal to sing songs written and tuned by him. Prof. Aminul Islam, University of Ohio writes that during the time of Ramtanu Lahari scholar, Jasim Uddin visted almost all rural area of Bengal and as a natural poet his mind was filled up with the treasures of folk culture and his music (Nishtte jaio Phulo bano, O daradi etc) spread all over Bengal. Jasim uddin is one the best folk poets of Bengal. He thought that Abbas Uddin will sing his songs to immortalize folk tunes in Bengal air, land and water. Many famous songs compose and tune by Jasim Uddin are seen in the market and broadcast by radio and tv but they forget mention the name of Jasim Uddin. You've set me adrift . . .
/images/padma24.jpg" width=320 hspace=12 border=0 align="right" alt="padma river-faridpur">A long time ago, when man did not obstruct rivers to suit his petty needs, the river channels served as goodwill ambassadors to extensive geographical areas - a river originating in one country flowing through another, joining another river, forming a filigree of merging and diverging rivers - with the social and cultural heritage of one region blending into another, each drawing on the rich yet varied perspectives in the whole process of cultural evolution. This is perhaps most apparent in Bengal's rich and enviable variety of folksongs. 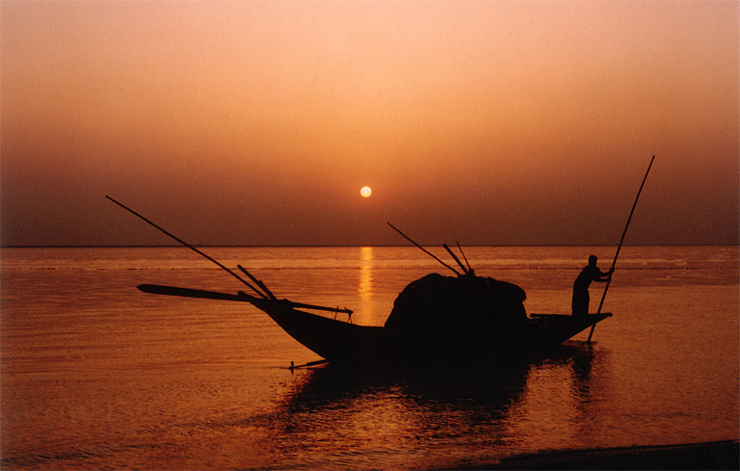 Rivers form an integral part of the topography of Bengal: "Bangladesh is the land of rivers. Ganga, Meghna, Dhaleshwari, Shitalakshya, Gadai - in so many names and in such myriad forms these rivers encircle Bangladesh. Playing on the silvery strings of the rivers, an invisible musician has with his delicate touch composed the song of its heart - the bhatiyali. 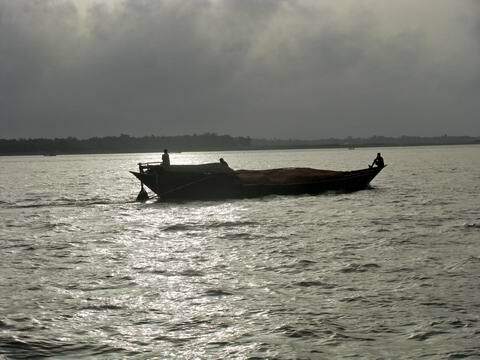 Several areas remain submerged in rainwater for almost six months in a year, with the boat the only mode of transport . 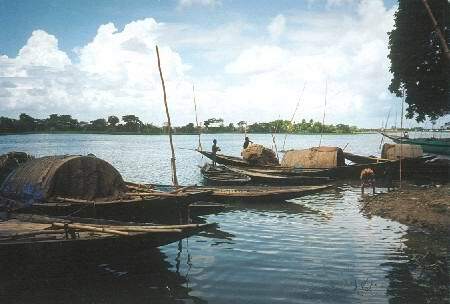 . . separated from their families for months on end, they have for their companion only the river on which they row their boats, with the waters merging into the horizons, and the azure heavens above. It is as if the waters are limitless. And the boatman, in his solitude questions his own existence - where have I come from? Where do I go hence? such questions pervade the songs of boatmen. 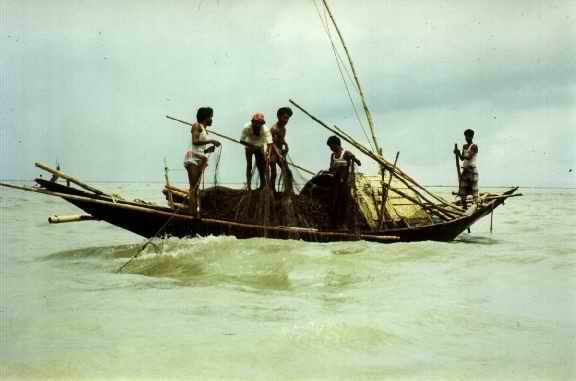 Bhatiali songs, popularly known as boatman’s songs are popular among the boatmen of Bangladesh and West Bengal. The songs are believed to have originated in low-lying areas of where boats once were the only means of transport. Ample references exist in the medieval musical literature of India to a raga known as Bhatiali or Bhatiari. Musicologists presume that the present day form of Bengali folk music derived from this classical raga. Though the bhatiyali remains one of the most popular folk melodies, with the river and the boatman as integral parts of its content and composition, the river and the boat are very common symbols with spiritual overtones used in folksongs all over Bengal. The scope of this essay will not permit me to go into the complexities and the variety of the spiritual problems and themes used in folksongs with the symbolic use of the river. I will try to cite a few examples to illustrate only some ways in which the river features in some folksongs of Bengal. One of the most famous and extremely popular bhatiyali songs is from the collection of the renowned poet and the folk music exponent Jasim Uddin (1904-76). In 1964 in Calcutta, a group of committed scholars and folklorists had gathered together to form the Folk music and Folklore Research Institute at Khaled Choudhury's house, out of a growing "awareness of an impending crisis in folk music" compounded by "commercial distortion" and the consequential falsification of the folk genres. The commercial distortion has grown more and more macabre over the years, and one is pained to hear cosmetic bauls who sing pseudo melodies in a "heritage park" in Calcutta, forming just one of the trappings that make up India; or the lofty notes of a bhatiyali melody just serving a background score in a film - the rich earthy song of the soil decontextualised and deconstructed to serve the selfish ends of modern urban civilisation. The neglect that has ravaged folk music has been most evident in the glitzy packaging of the folk to sell as exotica abroad. The folk traditions of Bengal have died a slow death, despite the laudable efforts of Gurusaday Dutt, Dinesh Chandra Singha and other scholars and revivalists. What we require today is a serious and committed research which can save whatever is left of the fast depleting forms of folk music in Bengal. The rivers are ridden with the politics of water sharing. Where are the boatmen who can sing out into the blue heavens: "You've set me adrift..." ? Bhatiali is a song of the river side and broad fields, drawing out in long, slow measure and with a melancholy content generally a contemplative yearning for a beloved. 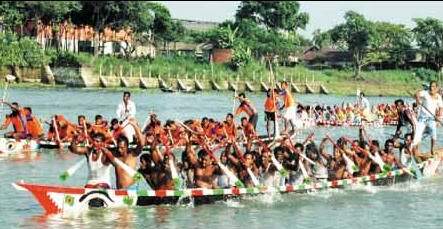 Sari is essentially the boatmen's song, rendered with verve to the accompaniment of vigorous rhythmic strokes of the oar as the boat glides on the river and is usually sung in chorus. The melodic structure of both types are simple. The literal meaning of the word dotara is 'two strings'. The dotara is used throughout west Bengal and Bangladesh but nowadays can be found with four strings instead of two. Rural singers and musicians consider it a sacred duty to make their own dotara and various songs have been and are composed in praise of their favorite instrument. The dotara has now become the principal accompaniment to the wide varieties of Bengali folk songs. 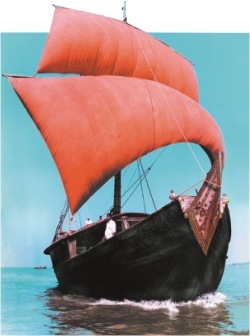 Construction : The body of the dotara is made from a single log of the jackfruit or marposa tree. The lenght of the instrument may vary between 60cm to a 100cm while the width of its hollow belly covered by goat skin, maybe 12cm to 20cm. The resonator or "sound box" may be made with half a coconut shell or even a Gourd. The part of the body leading to the neck is also generally hollow. It is covered by a metal plate which serves as the finger-board. The finger-board on the neck is fretless. Four strings run from the top pegs on the neck to the end pin at the bottom of the instrument. The strings are stretched over a bridge placed on the sound membrane which has seven small sound holes. The bridge and the small plectrum are made of bone, hard wood or antler horn. The end pin made from bone is in the shape of a comb and each string is tied to one of of the comb teeth. Strings are often of steel and bronze but mooga (silk) and gut strings are also in use. In this case the string for ma is generally of steel while the mooga gut strings are used for sa of the middle saptaka and pa and sa of lower saptaka. Recently the dotara has also often come to be fitted with a number of thin sympathetic strings called tarab which are placed underneath the principal strings and function to create additional resonances and harmonics. Tagore patronised others and he himself collected a large number of folklore materials from his vast estate of East Bengal, including Bangladesh. He himself wrote : "When I was at Selaidah, I would always keep close contact with the Bauls (mystic folk singers) and have discussion with them, and it was fact that I infused tunes of Baul songs into many of my own songs". Many people say that 'Tagore used numerous folklore themes in many of his poems, songs, dramas, novels and short stories. Other scholars, who made important contribution to folklore were Upendra Kishore Roy Choudhury : Toontooni Pal (1910 Book on Toontooni) and Mitra Majumder Takore: Thakur Mar Jhuli (1906 Grandmother Stories), Monsur Uddin (collector of Baul songs), Jashim Uddin (who was famous for his folklore themes in dramas and poetries). 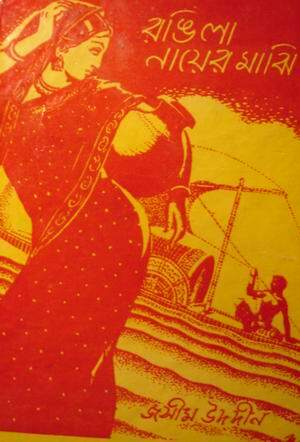 The third phase of folklore movement began in Dhaka, then East Bengal, in the year 1938, when the Eastern Mymensingh Literary Society was established. This promoted the collection and study of folklore. Folklore activities were, however, much accelerated when the then government established the Bangla Academy in Dhaka in 1955 to promote research work on Bengali language and literature and collected, preserved and published folklore materials. Folklore candidates, appointed by the academy, worked in regions rich in folklore. As a result, folklore materials of high quality poured in on an unending stream. 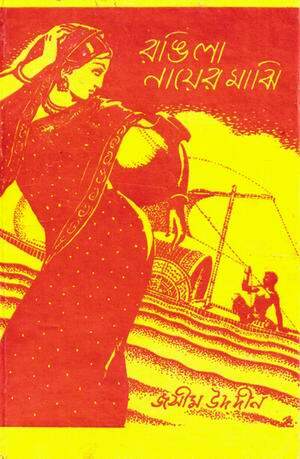 So far, the Bangla Academy has published many books on folklore. Bengali ballads which are called Gatha or Geetika in Bengali are one of the earliest variety of folksongs. The dates of origin of Bengali ballads will safely go to up to the Middle Ages, if not earlier. Divergent opinions have been expressed as to the origin of ballads. There are two contending groups : (1) communalistic, and (2) individualistic. The first group saw in ballads a continuing traditions from the primitive ages and thought that these were made by a kind of communal improvisations for communal recreation. Later, critic suggested that people were too indefinite, too disorganised for such concerted efforts, and that ballads were composed under the direction of a leader who brought the necessary discipline in songs and who functioned as the main organiser and guide. According to the critics, after an individual ballad was composed, it passed on from people to people, community to community through oral traditions. In the process some were changed, improved and sometimes even deteriorated. This individualistic theory has been accepted by the scholars at both home and abroad. Behind ever art is a man, behind the man is the race and behind the race is the social and natural environment and these influences are sure to be reflected on folklore. Bengali ballads give us an idea of the Bengali society in the Middle Ages, its joy and sorrows, laughter and tears. 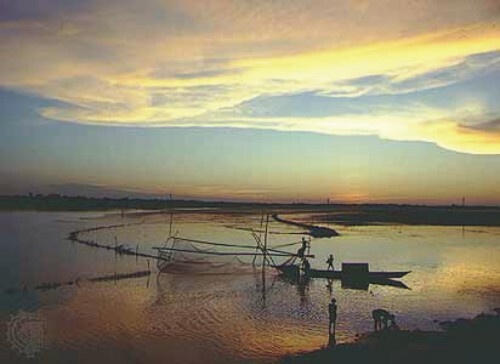 Bangladesh is the land of rivers -- almost all villages are linked with rivers. There is a proverb which says, "There is not a single village without a river or a rivulet and a folk poet or a minstrel". The struggle for existence was not as hard in Middle Ages as it is today and the minstrels and folk poets had ample opportunity to enjoy nature and pass care-free-time in composing songs and stories. Moreover, they were always patronised by the local feudal lords. It was, of course, Islam that gave the highest acceleration to the development of the Bengali ballads. The Turks conquered Bengal at the beginning of the 13th century. Muslims brought with them a huge store of Persian literature. The low-caste Hindus for the first time in their life had the opportunity to talk and mix with the conquering race. They saw that there were no barriers to caste and creed among Muslims and that all men were equal in Islam. In due course, the influence of the Persian romances reached the remote corner of the country. Gradually, the Hindu society also came to know of this and humanism like the south wind blew over the literature of Bengal. Even though these stories and songs were composed earlier, they were unfortunately collected from the oral tradition only by the second decade of the 20th century. It is quite obvious that these stories underwent a great change. Earlier the poets were patronised by the feudal lords, but in the later period probably when the poets lost their patrons in the British period, they became the "property of the masses rather than the classes". May be, for this reason the quality of the folk stories and songs, composed in the later period, deteriorated. Many stories and songs have been collected till now. The ballads are usually sung in accompaniment with tabors, drums, and other folk instruments. Ballad stories are sung by a leader who is called "Gayen' and he has a group of associate singers called 'Paile' who join in the chorus in illustrating the episodes. 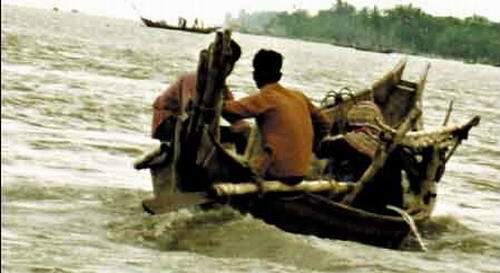 There are innumerable varieties of folk songs in the riverine Bangladesh which are sung by different cultural groups in different parts of the country. The most popular variety of songs can be divided into many different classes. The first class of songs can be divided into "Work songs" or "Occupational songs". 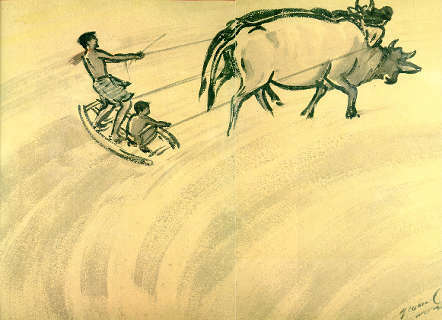 These songs include harvest songs, which are sung at the time of harvest or cultivation; songs of the bullockcart drivers or palan-quin-bearers sung at the time of carrying passengers from one place to another; songs sung by labourers when they built roofs of a house; 'sari-gaan', sung by boatmen in the month of monsoon, at the time of boat race, etc. Both Kavi and Jari sometimes go beyond the limit of their particular subject and in the course of singing introduces modern topics or amusing national and local events. Sometimes when ritual singers indulge in personal attacks through the exchange of sharp wits, the audience bursts into laughter. 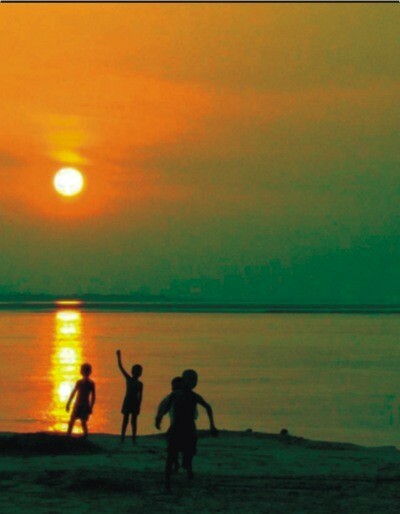 We see that all the folk songs and stories of Bangladesh inform us about the then society. It depicts clearly how the people used to think, their customs, and what the principles they used to follow. Through all the folk materials collected over the years we can learn more about our country's history and tradition. We learn that Bangladesh has rich cultural and folklore heritage, which may be compared with any other country of the world rich in folklore. Since folklore has already been accepted as a social, cultural and ethnic study, Bangladeshi Folklore will also have a distinct place in the study. 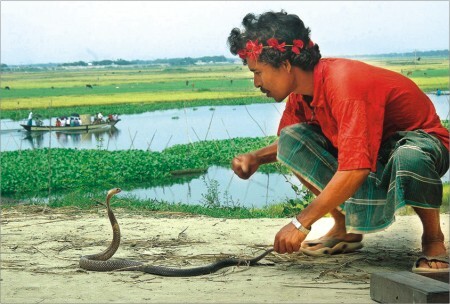 Bangladesh has an estimated 500,000 snake charmers, who rove the country like gypsies or live in riverboats. Some 5,000 have settled with their families in Porabari village, 32 km (20 miles) from Dhaka, where every household boasts a basket full of snakes, even though few charmers are teaching their children their art. "This is not because we no longer love snakes or dislike to play them for a living," said Alamgir Hossain, 45, who holds the title of "sorporaj" or "snake king", the highest honor in the community. "I grew up with the snakes, played with cobras, and, maybe you can say, romanced with them," said the father of six. "So did most members of the clan. They play snakes to crowds of villagers for money. But those days have changed." Now many of Porabari's charmers have taken other professions with more predictable incomes, like pulling rickshaws or growing rice and vegetables. Most send their children to school. Urbanization, deforestation and other environmental changes have also decreased Bangladesh's snake population. Even though the government has banned the killing of snakes, villagers often kill serpents that have bitten or killed others. Hossain won his title after many years of devotion, practice and training in Bangladesh and India's Assam state. Today, few have the patience or inclination to do the same. He said he was one of only six living "sorporaj" in the country -- five of his predecessors were killed by snake bites. 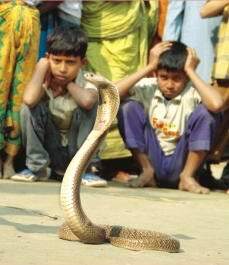 In Porabari, children play with snakes without fear, draping them around their necks like garlands. Female snake charmers often sell talismans and "medical" advice to illiterate villagers. 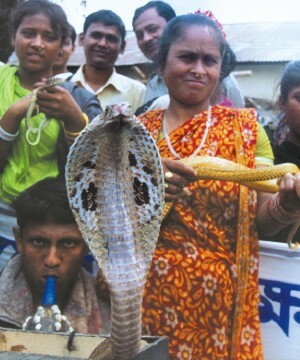 Male charmers are often called upon to cure people who have been bitten by poisonous snakes and are seen as "ujhas" or paramedics. Hossain said Porabari's charmers make most of their money from selling snakes to the other charmers who descend on the village for the weekly snake market. "I try to buy nearly 100 snakes in each consignment, for 400 or 500 taka ($6-7) each, and then sell them for a minimum profit," Hossain said. "But high quality snakes, like the king cobra, are rarely found and cost nearly 5,000 taka a piece." Members of a bede (river gypsy) community show a cobra spreading its hood at a human chain rally jointly organised by the community and Grambangla Unnayan Committee at Shahbag in the city yesterday. The rally was held to press home the demand of education for gypsies' children. Although in most Bangladeshi villages there is some local snake charmer, the main snake artistes, however, are the wandering snake charmers of Bangladesh, the Bedes. It turns out, there are three types of sub-professions within the Bedes. The groups are “Shapure”, “Sowdagar” and “Misisganni”. The group that is most heard of, of course are the Shapures. Some of these Shapures make their living by catching and selling snakes. Other Shapures train their snakes a range of tricks so that they can become entertainers. Nowadays, snake charmers are far less prevalent in Bangladesh than they were before, and this is not surprising. Even though their numbers of dwindling, plenty of professional snake charmers can still be found around the Bangshi river in Savar, the Dhaleswari in Munshiganj and the Padma. Padatik Natya Sangsad staged Palli Kabi Jasim Uddin's timeless tale Beder Meye at Bangladesh Mahila Samity Auditorium recently. The play is directed by Irene Parvin Lopa. As the title implies, the play is the saga of a bede girl. 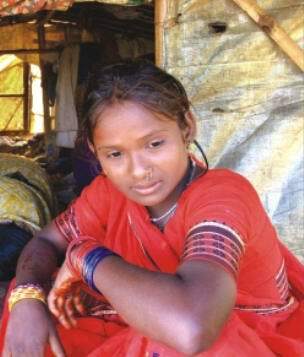 Named Champabati, her life changes forever when she is abducted by the morol (village headman). Despite fervent appeals, her husband (Gaya), fails to rescue her. He then leaves the village and marries another girl. Subsequent events lead to a dramatic denouement. The cast comprises Wahidul Islam, Mominul Haque Dipu, Saida Samsi Ara, Shafiqur Rahman Sagor and Arefa Sultana Lina, among others (Daily Star, June 30, 2006). Beder Meye is the 28th production of Padatik. wrote Pallikabi Jasimuddin in his famous poem on Asmani, a poverty-ridden rural girl in Rasulpur. Asmani is still alive and now 110 year old. A music company called Sweet Song Products released a music album titled ‘Asmani’ sung by Shamim Afroj Shima at Shaukat Osman Auditorium of Central Public Library on Monday. The organisers arranged the programme to provide financial help to Asmani, the protagonist of the Pallikabi’s poem of the same title. Managing director of the music company Ridwana Afrin Sumi in her address of welcome said that they want to help Asmani of Jasimuddin’s poem who is still languishing in poverty. ‘We want to help her by giving a part of the sale money from the music album,’ she added. Former secretary Syed Marghub Murshed was present as chief guest while Mohammad Shamsul Huda, senior vice-president (sales and marketing) of satellite television channel ATN; Mohammad Saidul Haque, executive director of Human Rights Review Society; Selim H Rahman, managing director of Hatil Complex Limited; Nargis Banu, director of Prashika and Imtiaj Mahmud Bhuiyan, chairman of Intellect Trade Link were present as special guests. Rezaul Karim, managing director of Organic Health Care Limited presided over the function. The speakers appreciated the initiatives of the music company in helping Asmani. They said that sufferings of this elderly rural woman were passionately described in the poem by Jasimuddin. The readers of this poem still feel for her but many do not know of her present situation.‘The music company has rediscovered the lady and presented her through the songs in front of the whole nation,’ they added. Music director Lokman Hakim conducted the programme, followed by a solo performance by the singer.Shima started the soiree singing Asmani, the title song of the album. Born into a poor Muslim family, Nazrul received religious education and worked as a muezzin at a local mosque. He learned of poetry, drama, and literature while working with theatrical groups. After serving in the British Indian Army, Nazrul established himself as a journalist in Kolkata (then Calcutta). He assailed the British Raj in India and preached revolution through his poetic works, such as 'Bidrohi' (The Rebel) and 'Bhangar Gaan' (The Song of Destruction), as well as his publication 'Dhumketu' (The Comet). His impassioned activism in the Indian independence movement often led to his imprisonment by British authorities. 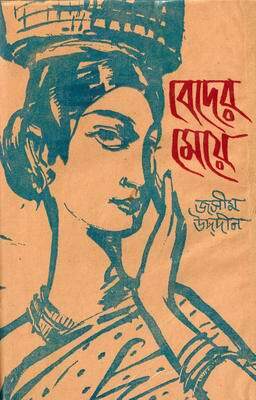 While in prison, Nazrul wrote the 'Rajbandir Jabanbandi' (Deposition of a Political Prisoner). Exploring the life and conditions of the downtrodden masses of India, Nazrul worked for their emancipation. Nazrul's writings explore themes such as love, freedom, and revolution; he opposed all bigotry, including religious and gender. 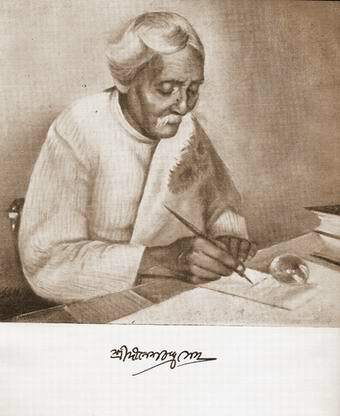 Throughout his career, Nazrul wrote short stories, novels, and essays but is best-known for his poems, in which he pioneered new forms such as Bengali ghazals. Nazrul wrote and composed music for his nearly 4,000 songs (including gramophone records) collectively known as Nazrul geeti (Nazrul songs), which are widely popular today. At the age of 43 (in 1942) he began suffering from an unknown disease, losing his voice and memory. 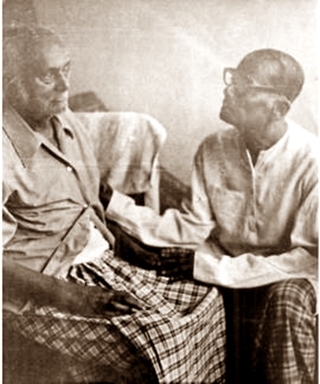 Eventually diagnosed as Pick's disease, it caused Nazrul's health to decline steadily and forced him to live in isolation for many years. Invited by the Government of Bangladesh, Nazrul and his family moved to Dhaka in 1972, where he died four years later, in 1976. In films, we can found Kazi Nazrul Islam as a film director, storyteller, musician, lyricist and actor. Nazrul debuted his film career through the film titled 'Dhruba.' Besides direction, he also acted and directed the music of the film. Then he has had also written story and directed of the films 'Patalpuri,' 'Gora,' 'Bidyapati,' 'Shapurey,' 'Dikshul,' 'Nandini,' 'Chaurangi' and others. Therefore, he also set up film related institution Bengal Tiger Pictures. However, many films had been made on the basis of the written story of Kazi Nazrul Islam. Ganguli Mor Ahato..- Angur Bala- Nazrul Geeti. Nazrul was a very dear friend of Jasim Uddin. 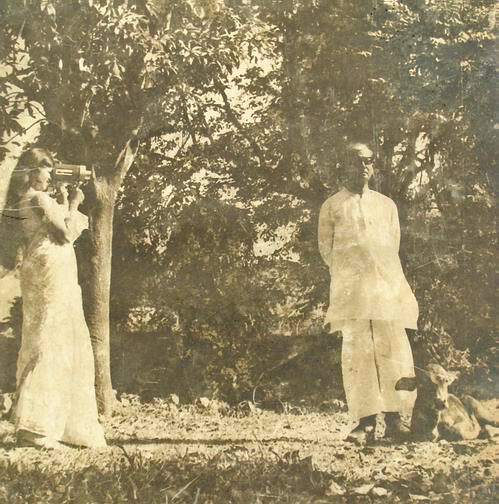 Nazrul visted Jasim Uddin's parent house at Village Ambikapur, Faridpur twice in 1930s. Kazi Nazrul Islam, popularly known as rebel poet (vidrohi kobi), was born on the 25th May 1898 at Churulia in the district of Burdwan, West Bengal, India. He was an exceptional talented person in Bangla literature. This patriot, poet, composer writer, political figure or the myriad minded man edited a politico-cultural magazine "Dhumketu". When still a school student in his teens Nazrul joined the newly recruited Bengali regiment (1916) and sent to Mesopotamia some months before the armistice. 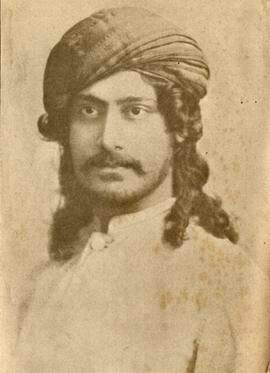 The regiment was not given a chance to face battle but all the same Nazrul got his fill of the fighting gusto which later-found expression in poetic effusion and warmth. His first two significant poems, Pralayollas (Exhilaration at the Final Dissolution) and Vidrohi (Rebellion) appeared early in 1922 and his first book of poem Agnibina (The lute of fire) was out before the year was over. The book was received with an enthusiasm never experienced in India before or since. After he joined the Kollol group and wrote mostly deft and pungent verse and songs galore. Nazrul Islam wrote a good numbers of valuable poems, songs, novels, dramas. He had a good command on classic Indian song. He could sing, recite and act with considerable proficiency. Nazrul was an emotional soul, but his emotion was unstable and volatile. Those who came in personal contact with him were moved by his irresistible enthusiasm and sincerity. But his literary output falls far short of his merit, except the early poems in Agnibina. After Agnibina his best known books of poems and songs are Dolonchampa(1923), Biser Bansi (The poisonous flute, 1924), Bhangar Gan (Songs of break-up, 1924), Puber Haoya (The east wind 1925) and Bulbul(1928). Dr Ashraf Siddiqie, a renowned folk exponent said, ‘The Institute seeks to preserve and spread Nazrul’s songs and literature. Up to the present, we have preserved and brought together about 2,000 old gramophone records of Nazrul songs. On the poet’s 29th death anniversary, we bring out an audio CD titled Padmer Dheu Re which is a recollection of the old Nazrul songs in authentic form, by the great artistes like Indu Bala, Angur Bala, Sachin Deb Burman and others of the poet’s own time. We need to publish various publications on Nazrul too. Abdul Hye Shikdar said, ‘We require Kazi Nazrul Islam’s songs and writings for our development as a nation, and the institute is there to nurture our culture through Nazrul’s works. But there is need for discussions and seminars on the National Poet. His songs and poems need to be made more popular. Awards should be given to those who have done exceptional work on Nazrul (New Age, August 29, 2005).. When the National Poet of Bangladesh Kazi Nazrul Islam appeared on the literary stage in Calcutta in the early 1920s with a bang he instantly drew the enthusiastic attention of the appreciative readers of Bengal. As a versatile genius Nazrul traversed almost all the branches of literature, such as, poetry, drama, music, novels etc. Nazrul had another identity; he was closely related to the movies. He was a film director, dialogue writer, music composer and music director. He worked both in Bangla and Hindi films. He worked in more than a dozen films. In 1931 Nazrul was offered a prestigious position of music director at Pioneer Films Company. Before Nazrul, no Bangalee Muslim glorified such a respectable post in the world of cinema of Indian subcontinent. Nazrul was related to cinema from 1930 to 1941. During this time he worked in more than 12 movies, such as, Dhruba (1934), Patalpuri (1935), Bidyapati (Bangla version, 1938), Bidyapati (Hindi version, 1938), Nandini (1941) etc. 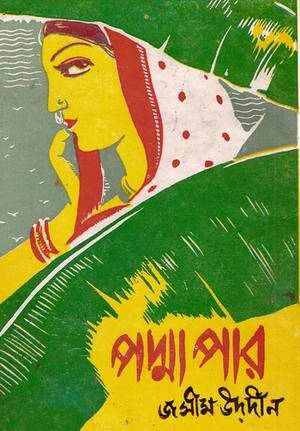 1933 was a remarkable year for the Bangla cinema. Nazrul's first movie Dhruba began to be prepared. On the first day of 1934 Dhruba was released in Kolkatta. In this cinema Nazrul was the director, songwriter, music composer, singer, and actor. In this movie there were two directors; Nazrul and Saityendranath Dev. It was produced and released by Pioneer Films. Dhruba included many melodious songs- as many as 18. 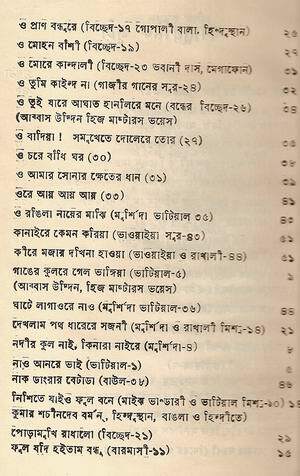 Among these 18 songs 17 were composed by Nazrul himself, and only one song was composed by Girish Chandra Ghose, a prominent dramatist, who wrote the story of Dhruba. Master Prabodh sang six songs, Angur Bala sang four, Nazrul sang three songs. Parul Bala sang two songs. There were some duets also; Kazi Nazrul Islam and Master Prabodh sang a duet, Angur Bala and Master Prabodh sang another duet song. It is unknown to the researchers, yet today, as to who was the singer of the song which was written by Girish Chandra Ghose. But it is known to us that Nazrul was the music composer of that song. 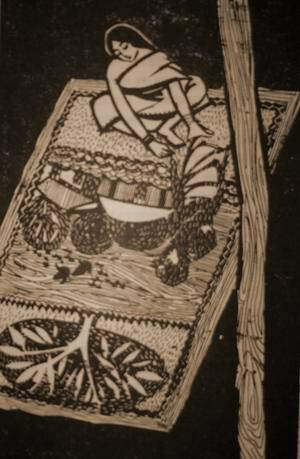 In Dhruba, Nazrul portrayed the role of Narod. The Story of Dhruba is just like a fairy tale. In ancient time there was a king named Uttanpad. The name of his wife was Suneeti who was a very pious lady. Everyday she used to worship the idle of Vishnu. So god generously gave them all kinds of wealth. The only lacking of the family was that this couple had no child who would be the next successor to the kingdom. 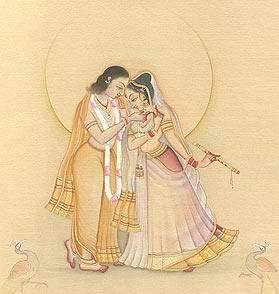 Suneeti, who was extremely devoted to her husband, wanted the king to marry again. Accordingly the king married Suruchee, a beautiful princes. Many days had passed, but Suruchee also failed to give birth to a child. Suruchee was very beautiful but also very cunning. Afterwards, she conspired and the king exiled Suneeti, the first queen, to a forest. One night the king dreamt that his ancestors ordered him to offer meat, from Mrigoya (hunting), to deities. That is why one day the king went a-hunting. But there rose a terrible rainstorm and the king lost his way. At last he begged shelter standing at the door of a hut. He was given shelter in that hut which was actually the dwelling place of the exiled queen Suneeti. After five years Suneeti came to the touch of her god. 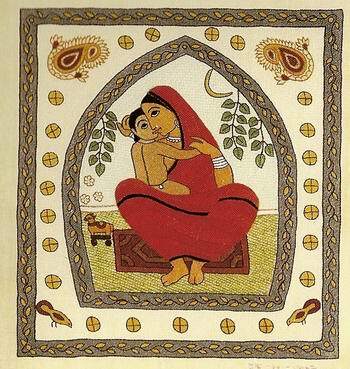 In that forest Suneeti gave birth to a child, a boy. The boy was named Dhruba. Day by day Dhruba began to grow as a prince in the hut of the forest. His mother informed him that king Uttanpad was his father. When Dhruba was only five, once he went to the palace of his father and begged shelter and clothes from his father. The king could recognize him and took him to his arms. The king wanted him to ascend the throne but the second queen Suruchee was in the way. Dhruba came back to his mother crying. At long last the king Uttampad brought the queen Suneeti and their son Dhruba to the place. In the film Dhruba, Nazrul played the role of Narod. Other central characters were Dhruba - Master Prabodh, king Uttanpad - Joy Narayan, first queen Suneeti - Angur Bala, second queen Suruchee - Sharifa. Nazrul's Dhruba is a milestone in the history of Bengali cinema. Dhruba included many melodious songs- as many as 18. Among these 18 songs 17 were composed by Nazrul himself, and only one song was composed by Girish Chandra Ghose, a prominent dramatist, who wrote the story of Dhruba. Master Prabodh sang six songs, Angur Bala sang four, Nazrul sang three songs. Parul Bala sang two songs. There were some duets also; Kazi Nazrul Islam and Master Prabodh sang a duet, Angur Bala and Master Prabodh sang another duet song. In the film Dhruba, Nazrul played the role of Narod. Other central characters were Dhruba - Master Prabodh, king Uttanpad - Joy Narayan, first queen Suneeti - Angur Bala, second queen Suruchee - Sharifa. Nazrul's Dhruba is a milestone in the history of Bengali cinema. Angurbala had recorded about 300 songs for the Gramophone Company of which 50 were Nazrul songs. "The most interesting experience was when I met Kazi Shaheb for the first time," went on the legendary artiste. Recalling those eventful days, Angur said, "We waited impatiently to meet him. We thought that he would be a bearded man, dressed up in alkhella, with a toopi on his head. However, we were charmed to see a completely different person attired in a gerua panjabi, a yellow silk turban and strings of beads around his neck. A creative genius of his stature never seemed distant. "Kazi Shaheb would compose tunes focusing on the speciality of the artiste. Sometimes he would just explain the notations and then say in his usual manner 'Angur, it's now up to you to add the sweet angur (grape) flavour of your voice.' That is how I remember Nazrul," reminisced Angurbala. Aashile E Bhanga Ghare_Angur Bala. Angur Bala was basically a stage actress and a singer par excellence. She learnt singing from Amulya Majumdar, Jeet Prasad, Ram Prasad Mitra and Ustad Jahiruddin Khan. At the age of 8, she appeared in stage. In the mean time her first disc was released from HMV under the supervision of Mr. Cooper. She became a singer star within a very short span of time. During this time she was introduced to Kazi Najrul Islam who then joined the gramophone company as a trainer. Under Kazi Najrul Islam’s supervision Angur Bala recorded her first Nazrul Geeti. Parallel to her singing career, Angur Bala continuded her stage acting. Nripen Basu introduced her to Bengal Theatrical Company where she played the lead role in the drama “ Muktar Mukhti” and was highly acclaimed. She acted for a long time in Minerva Theatre. Thereafter she joined the Star Theatre. The important productions of Star theatre she was associated with were “Poysha Putra”, “Chandidas”, "Mamata Shakti”, “Bidrohini” and “Siraj-ud-doula”. She made her film debut in the 1933 film “Jamuna Pulinay” directed by Priyonath Ganguly. Her important films were “Dhruba”, “Abartan”, “India”, “Khona” and “Debjan”. She also acted in several Hindi and Urdu films like “Nasib Ka Chakkar, “Maa ki Mamata”, “Char Darbesh” etc. She received D.Litt. form Kalyani University. She also received Natak Academy Award. She died in Kolkata on 7th January, 1984. "Can you explain what a ghazal is?" questioned Arjumand Banu. While I was looking for words, she explained in simple words, "Ghazals originated from Persian poetry based on love. It was Kazi Nazrul Islam who introduced Bangla ghazals that created a massive impact in the music scene. The songs with an exclusive pattern and melody took the music lovers by storm. This was in the year 1926. Nazrul was then hardly 27." There is no end to learning, I thought to myself. That day is firmly etched in my mind. It was in the same year ('74) that the virtuoso singer Angurbala visited Dhaka. She was the first to record two of Nazrul's ghazals Eto jaal O kajal chokhey and Bhuli kemoney in 1929 for the Gramophone Company that stirred the music aficionados to great heights. Never had they heard such songs with such passionate lyrics and tunes. Surely Nazrul's genius was unparalleled. 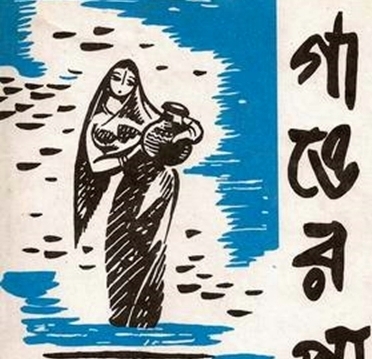 In 1958, the American Folklife Center (AFC) Archive acquired its first recording of Bengali folksong. Fifty years later, AFC repatriated this material to Bangladesh, sending a copy to the Folk Culture Museum at Jasim Uddin House in Faridpur. The repatriation reflected the American Folklife Center’s ongoing and evolving commitment to the preservation and stewardship of intangible cultural heritage, and to providing communities of origin with access to their materials. 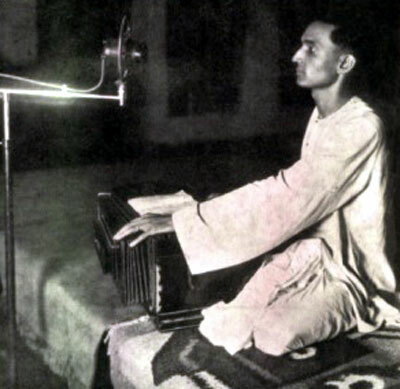 The field recording in question features Bengali folklorist and poet Jasim Uddin (1904-1976), known in Bengali as “Pallikabi,” or “The People’s Poet.” It contains ten performances of Uddin singing traditional Bengali folksongs, and providing commentary and English translations for the collectors. 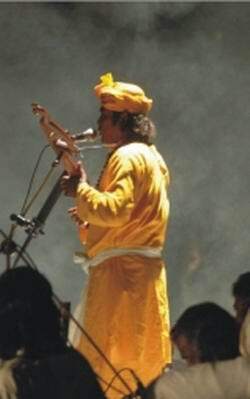 Uddin organized his recording session according the life-cycle customs of Bangladesh. Hence, his fi rst selection is what he terms a “birth song,” and this is followed by a children’s song. Th at rain might fall on the earth. The duration of the recording is fourteen minutes and two seconds. In this brief span, Jasim Uddin provides us with Bengali songs on the most important themes of human life: birth and death, childhood and parenthood, love and confl ict, nature and magic, the fertility of the earth and the ferocity of war. He organizes the songs to illustrate the life cycle as lived in a Bengali village, revealing himself to be a knowledgeable tradition-bearer, as well as a thoughtful professor and scholar. Though the recording technique is crude by today’s standards (e.g. the tape recorder is turned off after almost every song, which interrupts the continuity and causes the listener to miss parts of Uddin’s explanations), the sound quality on the recording is very clear, allowing Uddin’s musical and poetic mastery to shine. Jasim Uddin was born on January 1, 1903, in Tambulkhana, a village in the Faridpur district of East Bengal. As he related in his 1964 autobiography Jibon Katha, Uddin began reciting and writing poems at a very early age. “After writing three or four of my couplets in the notebook I was astonished. There were fourteen syllables in every line and the last syllable of every line rhymed with the second line’s last syllable…. Now that I had discovered how to fi nd a rhythm for my verse, who could hold me back?” By the time Uddin was a student at Faridpur Rajendra College, he had already won acclaim as a Bengali poet. Uddin’s poetry was rooted in the rural Bengali village life he knew as a child; his language was the language of the farmers, the fi shermen, the boatmen, and the weavers of Bengali country villages. Though he never achieved the international renown of his fellow Bengali poet Rabindranath Tagore, Uddin’s work is well known throughout India and Bangladesh, and has been translated for school curricula in both countries. At the time of Uddin’s birth, eastern Bengal was part of British colonial India. During his childhood, it was severed from western Bengal and made a separate province (Eastern Bengal and Assam), which angered Bengali nationalists. Although the region rejoined the rest of Bengal in 1912, in 1947 it was again ceded to become East Pakistan. As a Bengali nationalist in this critical period, Uddin was aff ected by the political and religious divisions of the era. However, he remained personally opposed to division within Bengali culture. Although he was a Muslim, he grew to love and respect the Hindu culture of his neighbors. In his memoirs, Uddin stressed his strongly held belief that Bengali culture, especially literature, belongs to both Hindus and Muslims. “Th ose who would separate the two [cultures] and write literature will not last many days, I am sure,” he wrote. Uddin was himself aff ected by this issue. 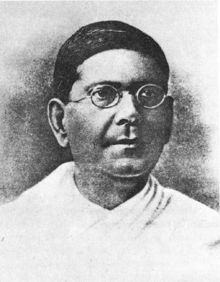 In the 1920s one of his poems was included in the matriculation exam at the University of Calcutta, which caused some controversy among the Hindu majority; his inclusion was defended by his mentor and friend, Professor Dinesh Chandra Sen. Uddin also treated the theme of religious division in his own writings, especially the long narrative poem “Gipsy Wharf ”, which depicts a romance between a Muslim boy and a Hindu girl. In attempting to depict both communities fairly, Uddin created a work that spoke to most Bengali people, and that has survived the test of time. Uddin was also an important folklorist. From 1931 to 1937, as a Ramtanu Lahiri Scholar at the University of Calcutta, he collected several thousand rural Bengali folksongs under the guidance of Professor Sen. In 1938 he left Calcutta to teach at the University of Dhaka. In 1944 he joined the government of East Pakistan in the Department of Information and Broadcasting. He retired as the deputy director of that agency in 1962. During the course of Uddin’s career, he collected over ten thousand folksongs, making him one of the most successful folklore collectors of his time. In addition, he wrote important articles and books on the interpretation of Bengali folksongs, folktales and other genres. Th is scholarly activity gives the AFC recording even greater interest for international scholars in ethnographic disciplines such as folklore, ethnology, and ethnomusicology. Staff at the American Folklife Center did not become aware of the importance of the Jasim Uddin recording until September, 2008, when Dr. Jamal Anwar, Uddin’s son, contacted AFC to request a copy for the Folk Culture Museum at Jasim Uddin House in Faridpur, Bangladesh. AFC staff made the copy, thus repatriating this small sample of Bengali cultural heritage. “Mrs. Cowell recorded twelve double-track tapes of various sizes and has now very generously off ered to permit the Library of Congress to duplicate them for the collections in the Archive of Folk Song. During the 1950s, southern and southeastern Asia were represented in the Archive only by thirty-nine short commercial discs from India, a single reel of Pakistani music for the sitar, and two reels of songs and instrumental music made in the Library’s recording studio by a visiting Th ai musician. For that reason, Korson explained, “we feel that for this area in particular, we must take advantage of every opportunity which presents itself.” Fortunately, Spivacke agreed, and the duplication project went forward; as a result, the recording has not only been preserved at the Library, but repatriated to Bangladesh, where it can be heard in the museum at Faridpur. 1 Uddin, Jasim (Jasimuddin). 1939. The Field of the Embroidered Quilt: A Tale of Two Indian Villages (translated from Bengali to English by E.M. Milford). Calcutta: Oxford University Press, Indian Branch.